I have dedicated almost the entirety of my adult working life to cars and motorsport, but in the past year, the ante has been upped significantly. At the start of the year I made a commitment to take it to another level. It’s been an incredible ride. Shooting around Australia and overseas has been a dream come true. My sincere thanks to all the amazing people that helped make it happen. I’ll warn you now, this is a long read, so you might want to make yourself comfortable and grab some refreshments before you get started! 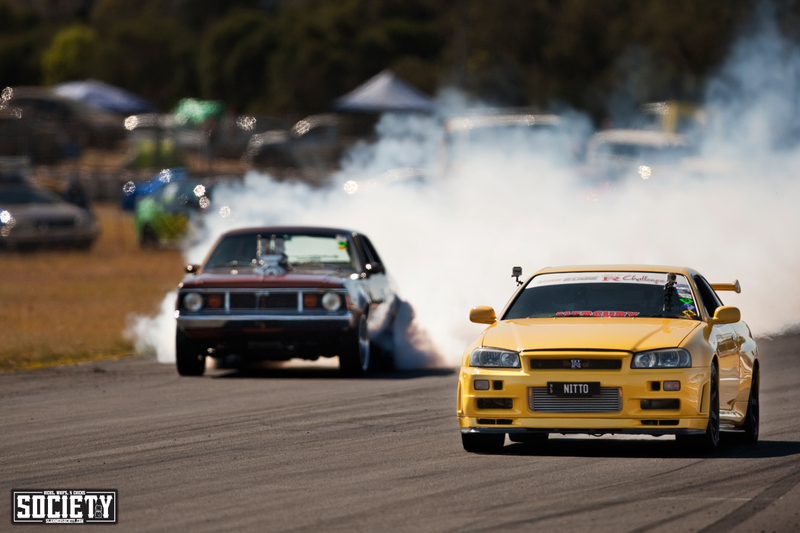 The year kicked off in January with the Straya Day drift festival in Sydney, that represented everything we love about drift life. 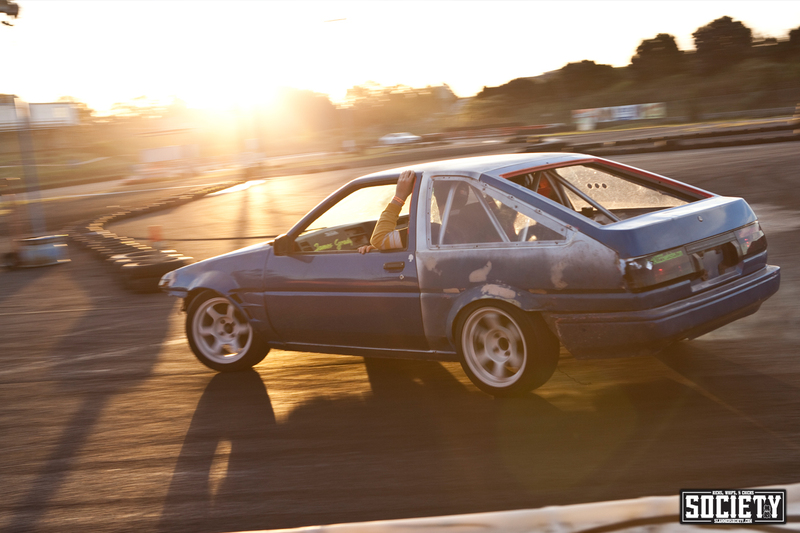 Great cars, heaps of friendly faces, and tyres blazing. 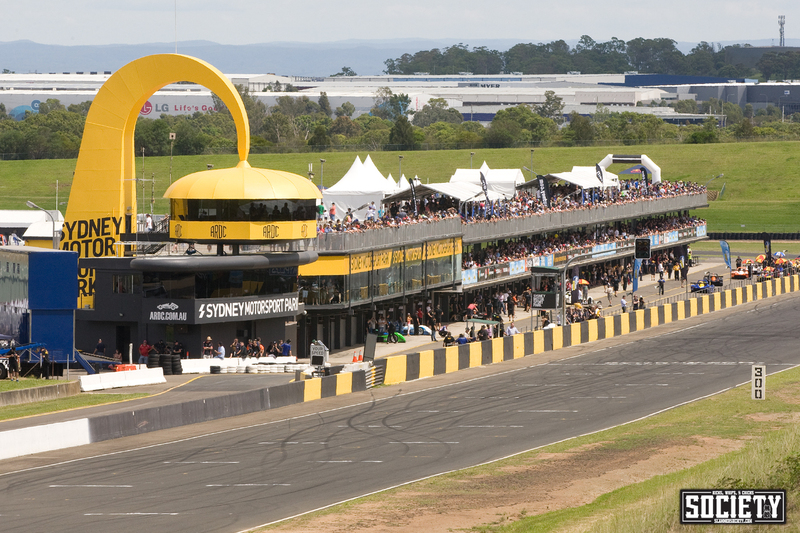 Just a few weeks later in February, I made my first ever trip to what is the holy grail of Australian race tracks and the home of some of the greatest motorsport rivalries. 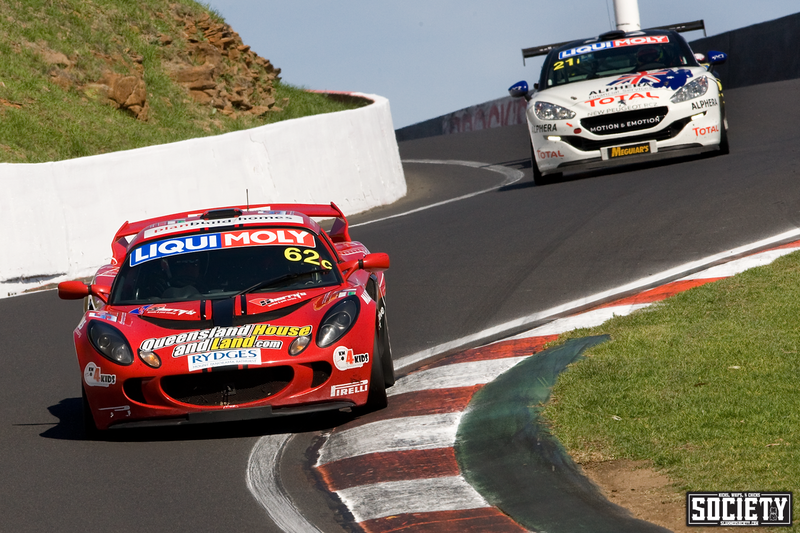 Travelling with the Queensland House and Land Lotus team, it was a great moment to finally shoot at Bathurst. 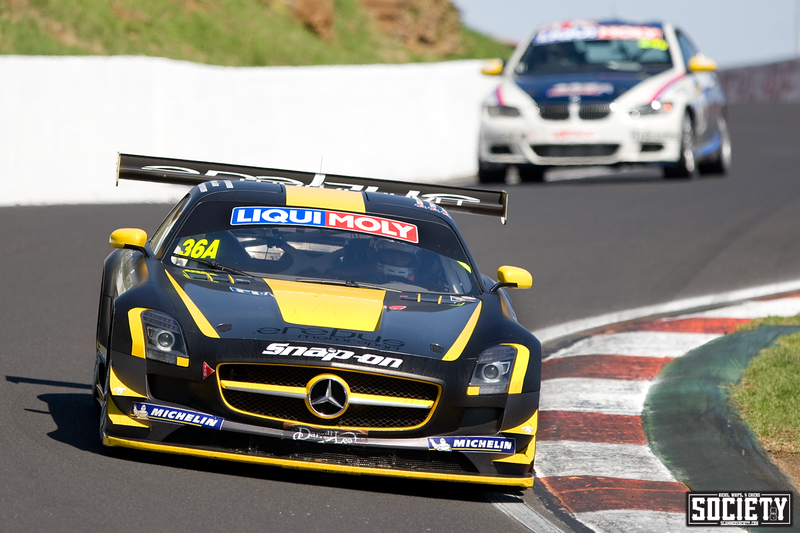 The Mt Panorama circuit is just over 6km in length and is essentially a street circuit, as the track is simply public road outside of major events. 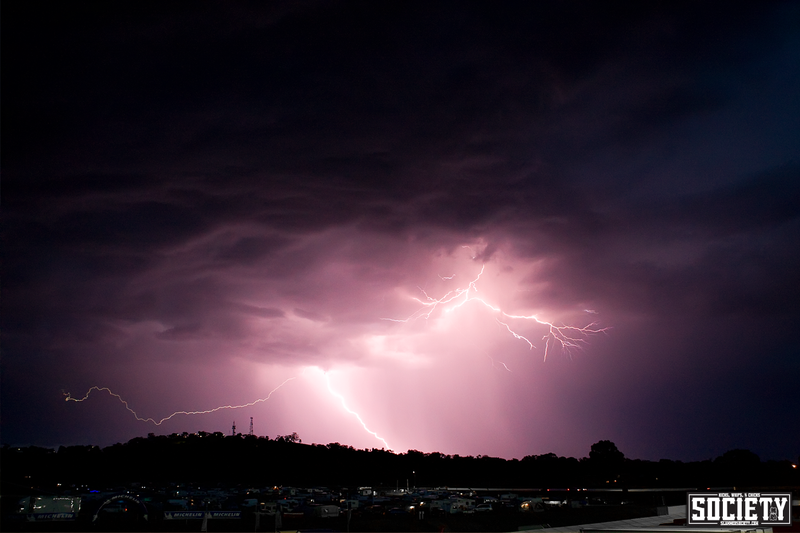 The sky lit up on Saturday night giving us a spectacular display over Mt Panorama. 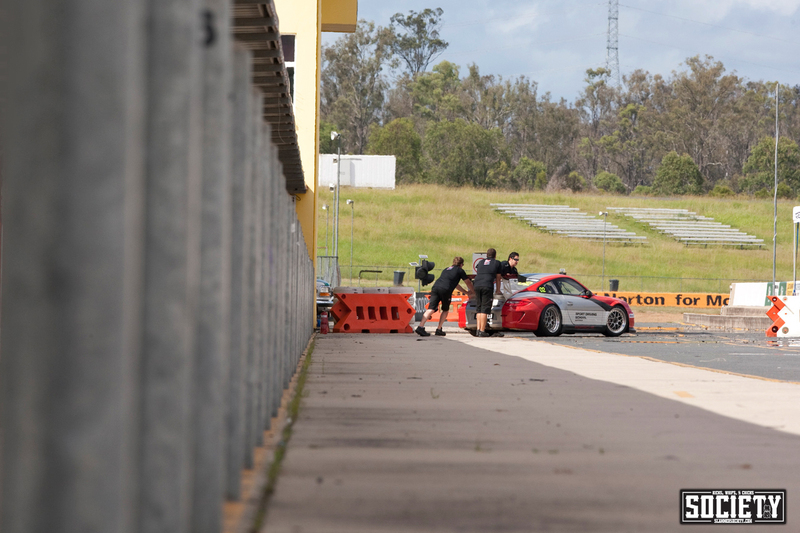 There is plenty to see around the pits at the 12 Hour, but the Erebus SLS AMG continues to impress, the sound of this car needs to be heard to be believed. The presence of the SLS is undeniable. 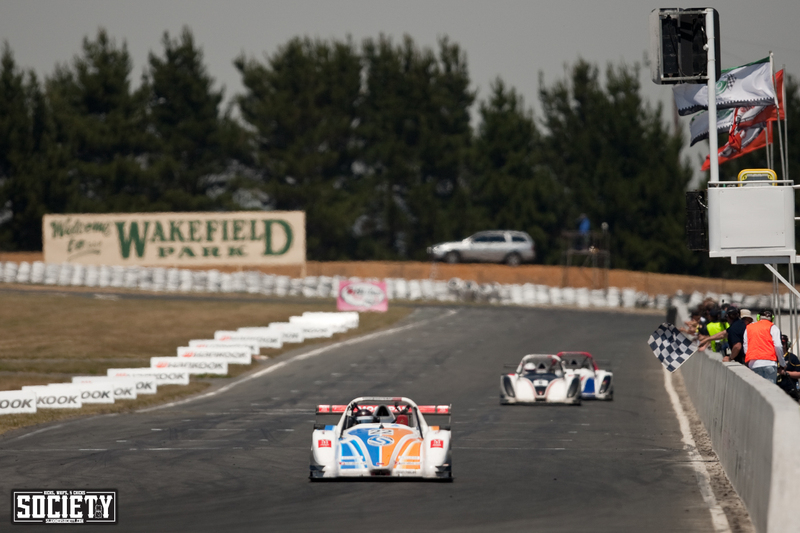 One of the most striking differences between this track compared to other tracks around the country, is the rise and fall of the track, with the difference between the highest and lowest points being 174m (570ft) making for some exceptional vantage points and incredible racing. 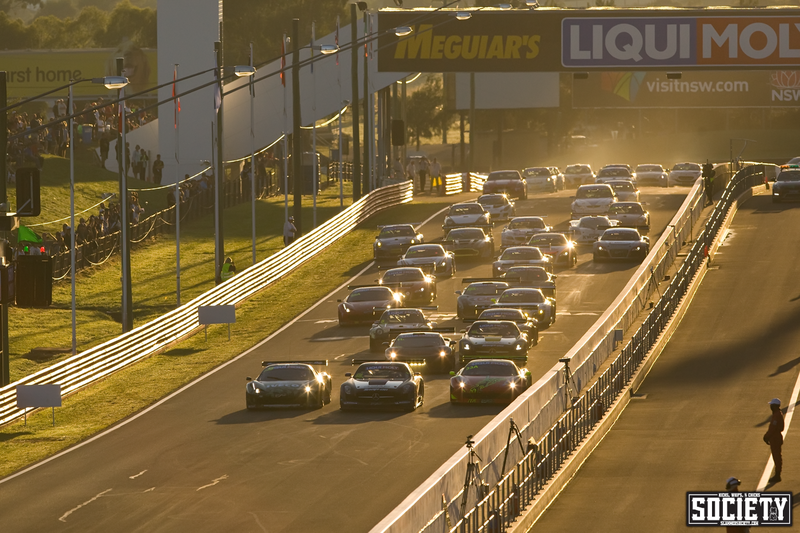 The 12 Hour race commenced on Sunday morning as the sun broke over the horizon. The effort from the team in the pits was one of the most impressive parts of the weekend, with a gearbox issue in the Lotus on Saturday, the team worked through the night until the problem was resolved, then on less than an hours’ sleep, they worked tirelessly through the 12 hour race, keeping the car on song, managing the driver changes and the fuel stops. 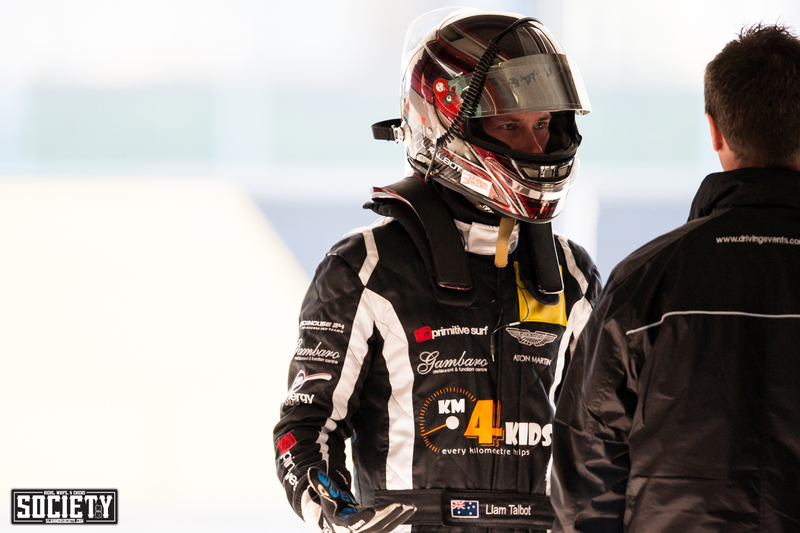 The intensity was equally matched by the drivers as they prepared for their stints behind the wheel. The team went on to secure an outright class victory. 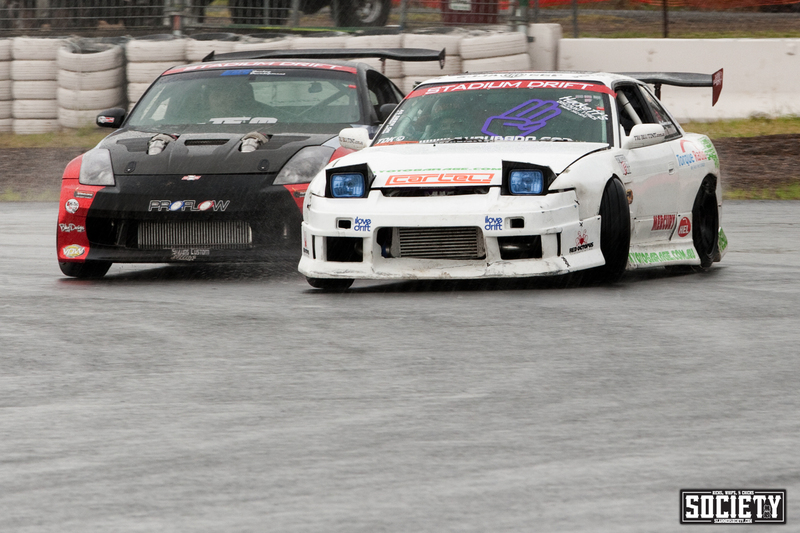 A week later, I was back at my local track of Queensland Raceway shooting a very wet round 1 of the Stadium Drift Pro Tour. Shooting in the rain is never the most enjoyable activity, but to catch door to door action from drivers like Dan Rasell and Matt Hambridge is absolutely worth it! 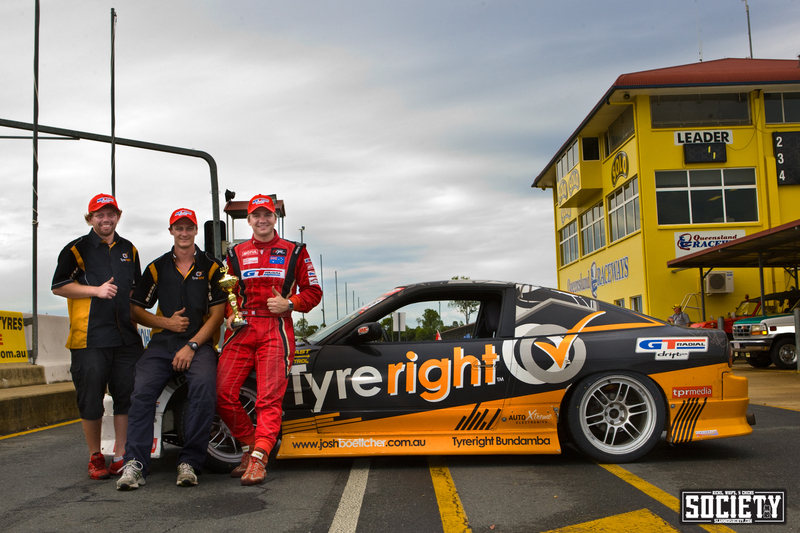 Josh Boettcher went on to secure the win in his Tyreright GT Radial backed Sil80. 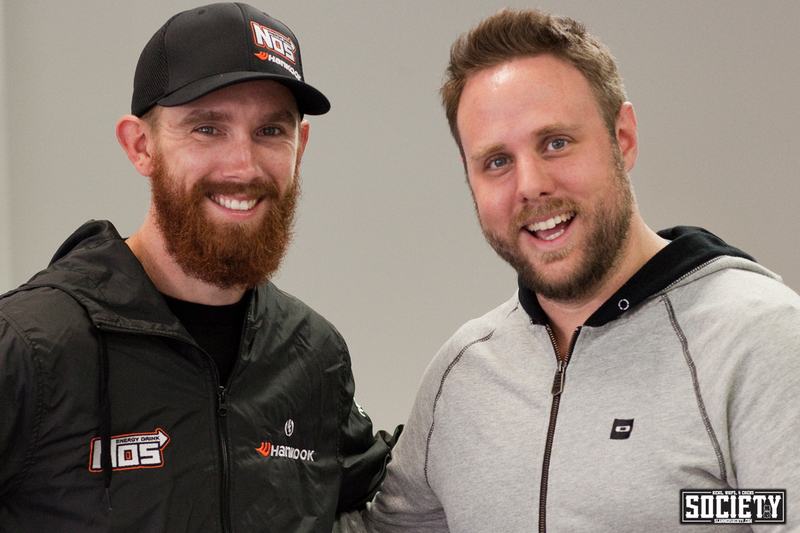 Two weeks later and it was wheels up with Rob Whyte from the Achilles Radial Drift Team as we headed to New Zealand to compete in D1NZ. The best way to celebrate getting the cars out? Shipping container burnout. 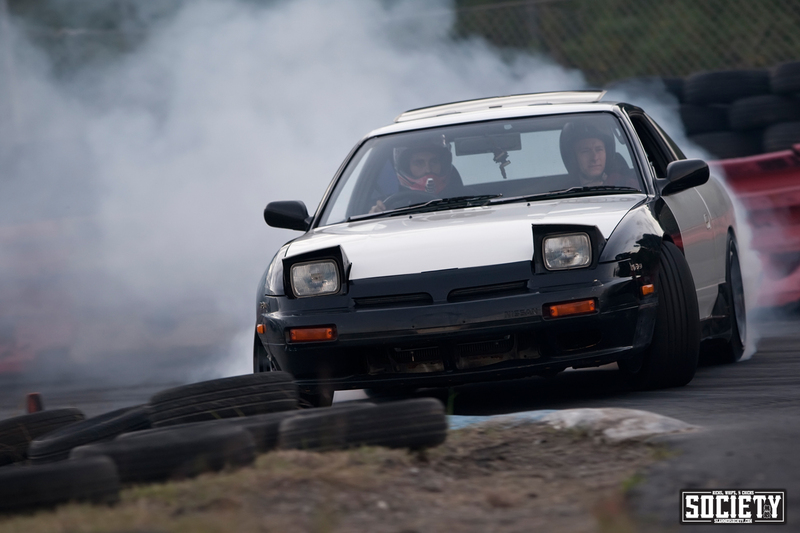 Travelling with Rob and Andreas Paraskevas from the Insane Drifters, it was in incredible opportunity to see how its done across the ditch at D1NZ. We certainly were not disappointed! 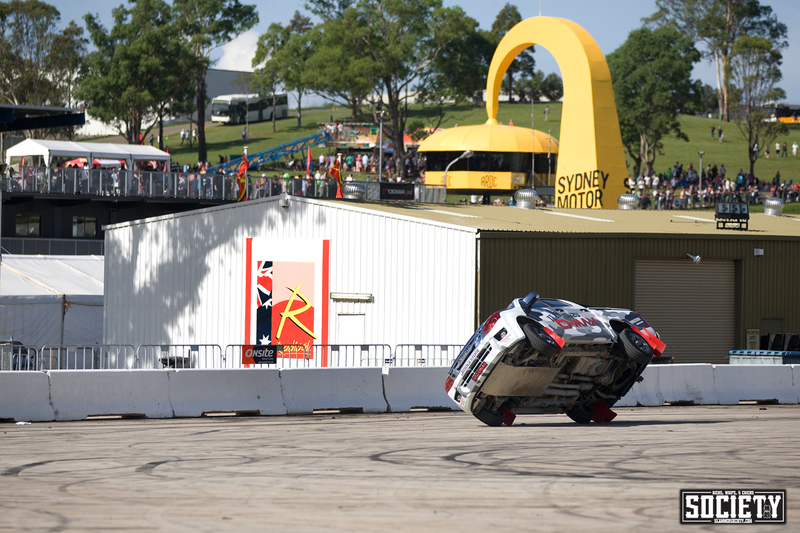 Crowd favourite Mad Mike dominated across the weekend. 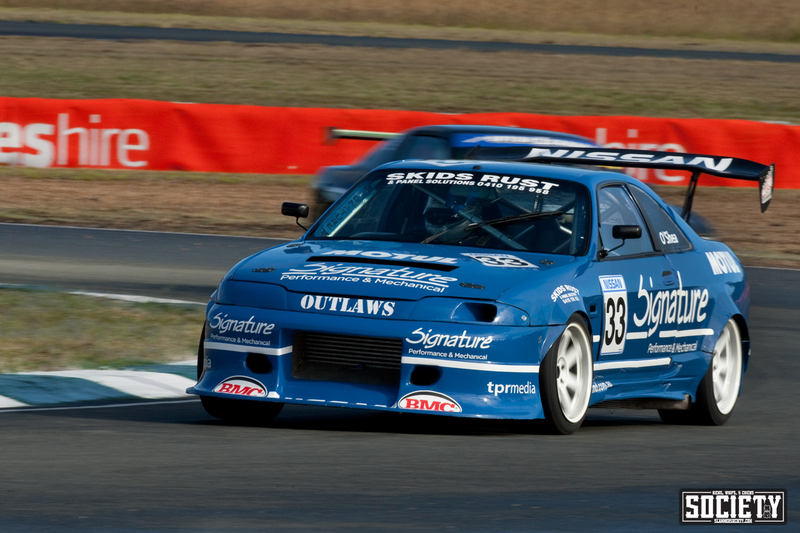 Rob suffered catastrophic gearbox failure in the top 16 battles, which was a real shame with the distance travelled. However, on returning home, he upgraded from a factory box to a Holinger Sequential to sort that issue once and for all! 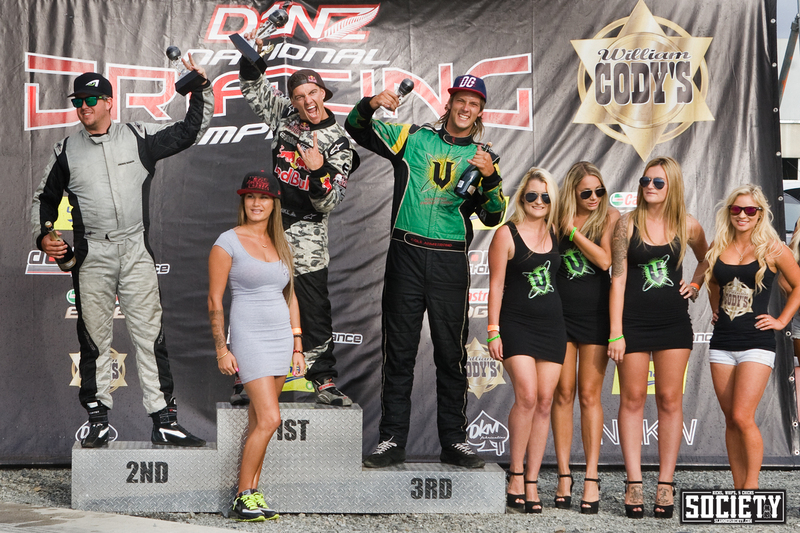 Mad Mike took the top honors for the event. 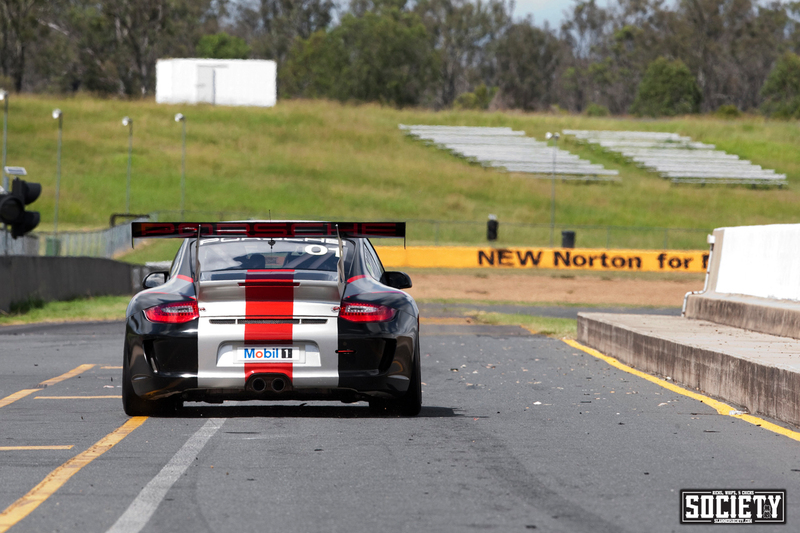 Back from New Zealand and it was out to Queensland Raceway with Liam, as he had his first stint in a Porsche Carrera Cup Car. Getting used to car and rapidly gaining confidence behind the wheel, he started to reel off some impressive times for a first drive. 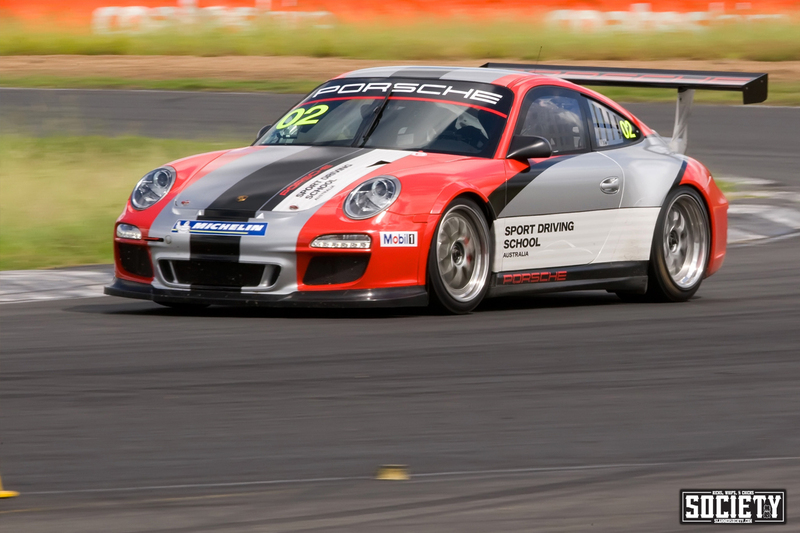 I’m a big Porsche fan and enjoy nothing more than a Carrera Cup Car a full noise! Back to Sydney and all the stops had been pulled out for the very first Top Gear Festival in Sydney, hosted by James May and my automotive journalist idol, Jeremy Clarkson. Insanity is probably the best word to sum up the weekend. You name, it was there. 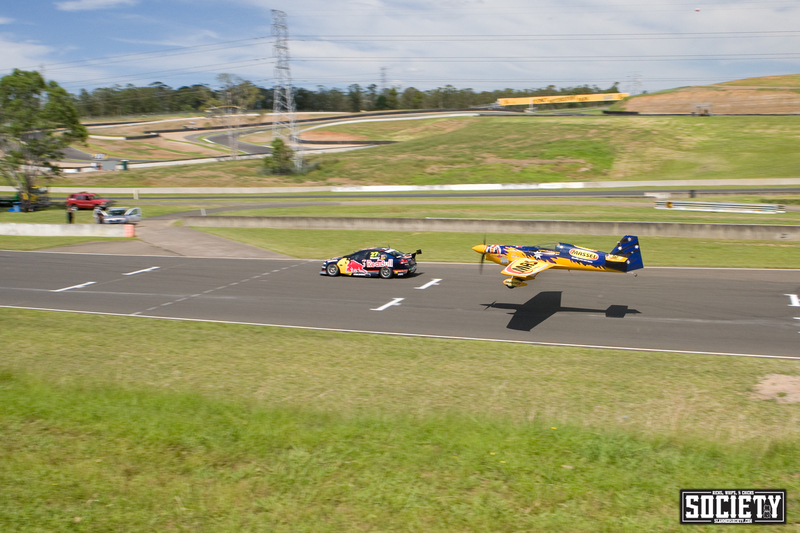 From R/C cars, to stunt driving, two wheeling, drifting, racing, right the way up to Mark Webber unleashing his Red Bull Formula 1 on Sydney Motorsport Park. Truly a sight to behold. The crowds give you just a small idea of the sheer size of the event. 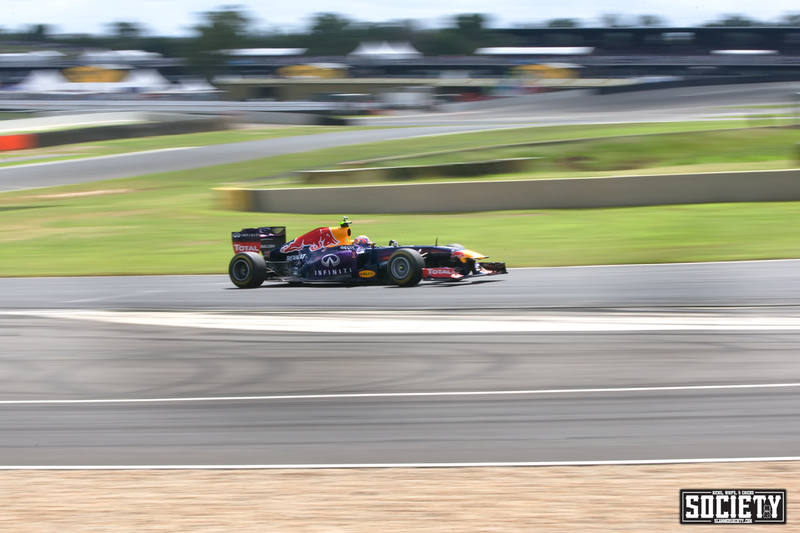 Webber on track in his F1 car. 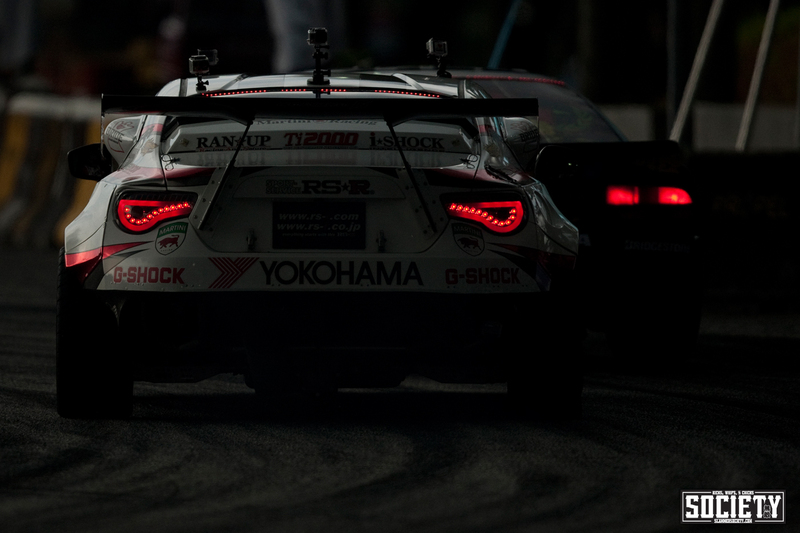 All eyes were firmly on track during his laps. 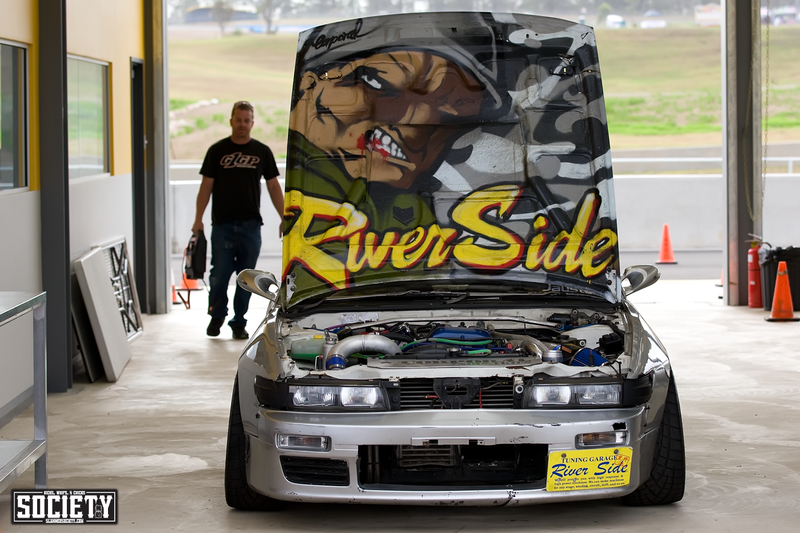 The Queensland based Drift Syndicate rolled out their new livery for the event on their tyre frying, supercharged V8 Commodore. There was even a rally track set up, with ARC and Polaris tearing up in the mud. 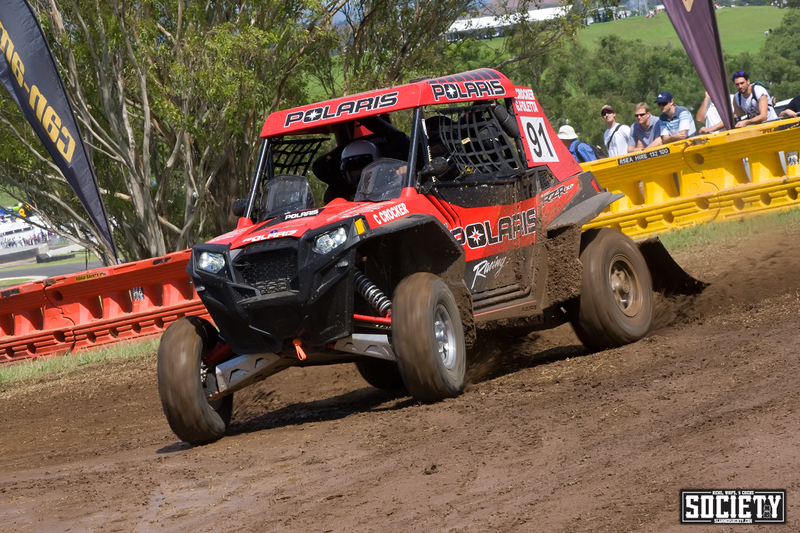 Two-wheeling in a Isuzu D-Max was a pretty impressive stunt! 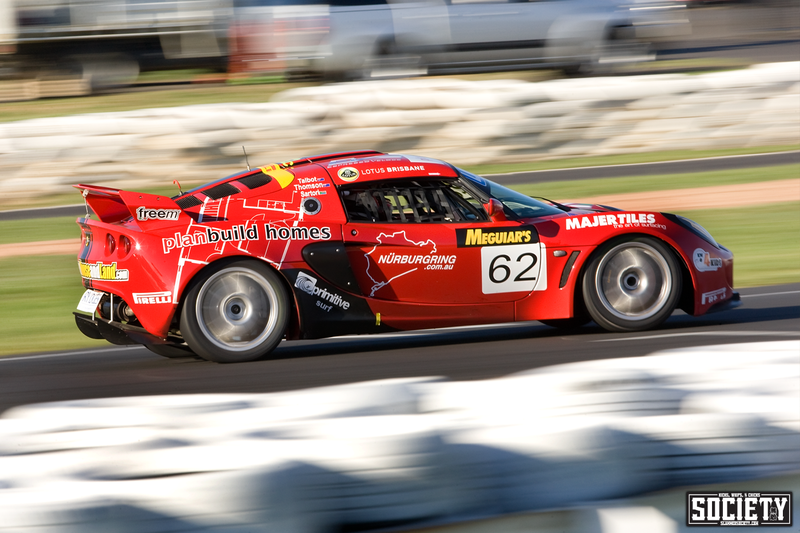 Everywhere you looked there was action on track, Nick Coulson was blazing his new Achilles livery. My automotive hero Jeremy Clarkson racing a sprinter vs R35 GT-R race in typical Top Gear style. 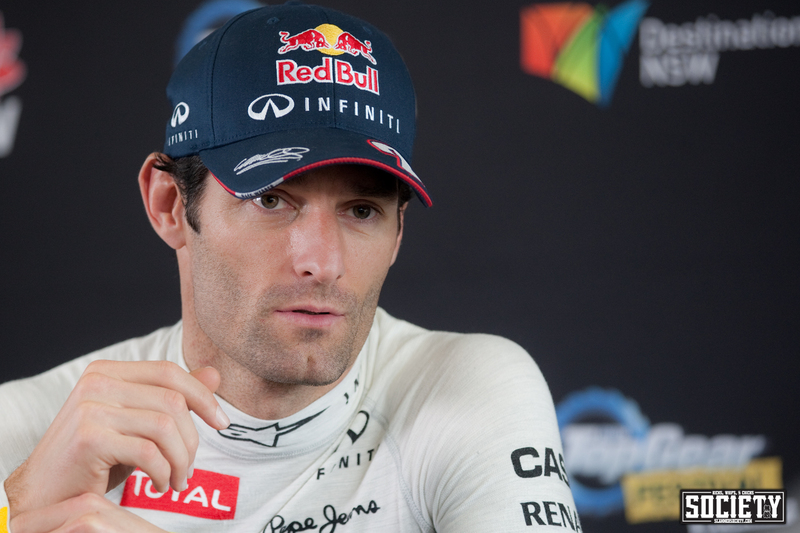 The press conference with Mark Webber is an event I won’t soon forget. 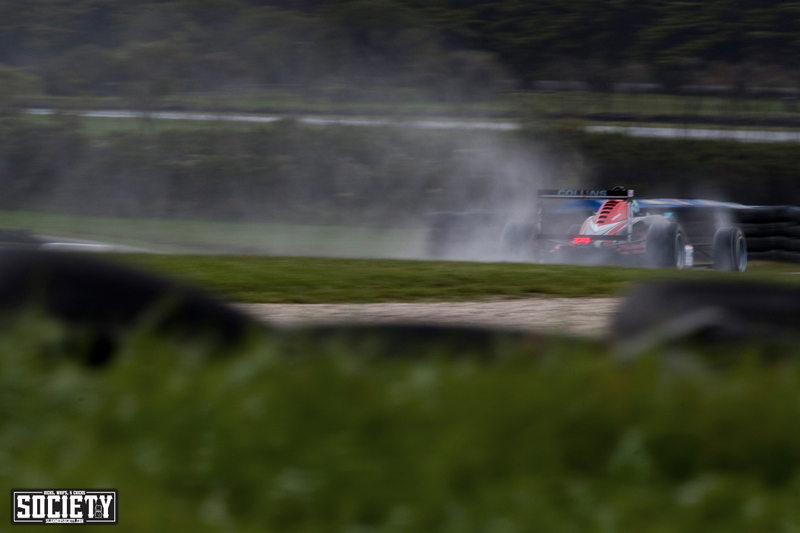 Like most automotive photographers, we have romantic notions of shooting F1. For just a moment, it felt like I was there! 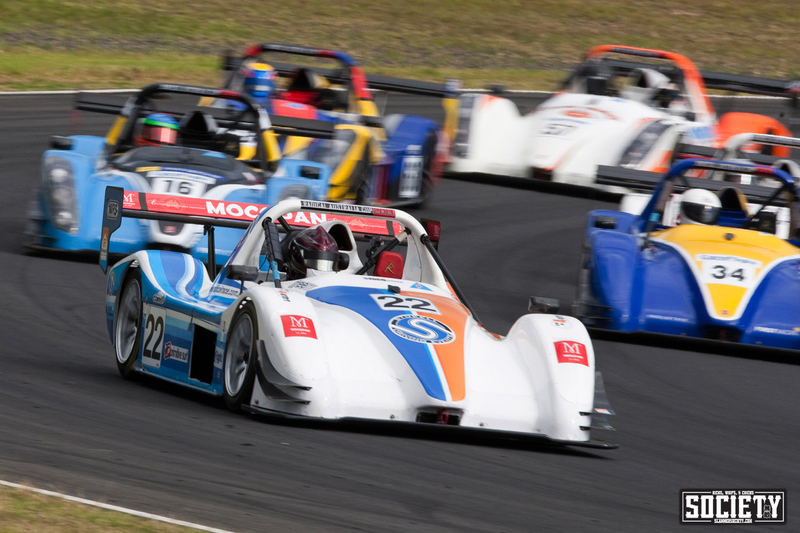 A fortnight later and it was back to Sydney for Round 2 of the Radical Australia Series, when driver Liam Talbot secured his first podium, in this his first year in the series. The driving isn’t worth watching, but the sound this beast makes is well worth listening to! 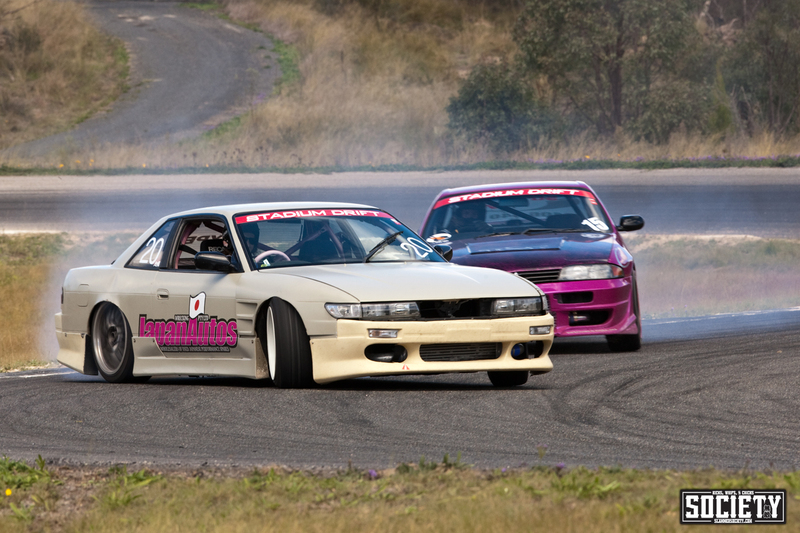 April brought a few weeks of recovery, but round 2 of the Stadium Drift Pro Tour at Stanthorpe was one I couldn’t miss. 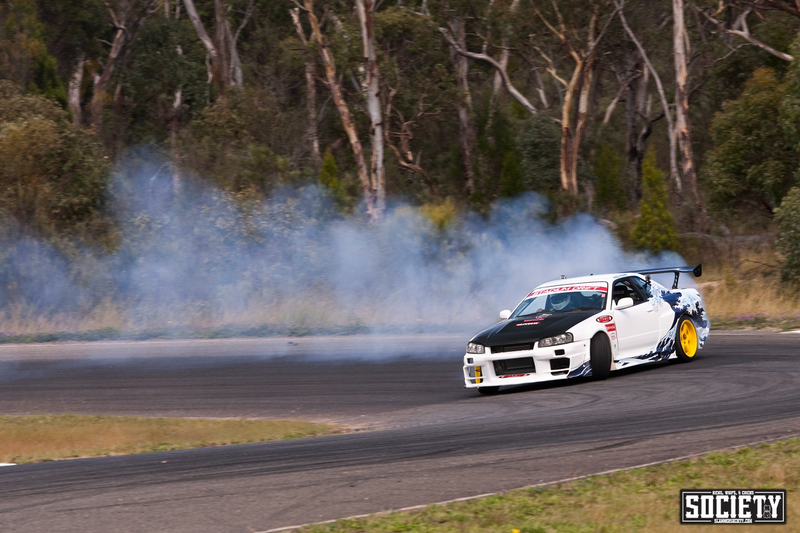 It is still one of my favourite tracks to shoot drift. The sweeping second corner lets the drivers hold out the slide. And get them pumping smoke with plenty of angle. 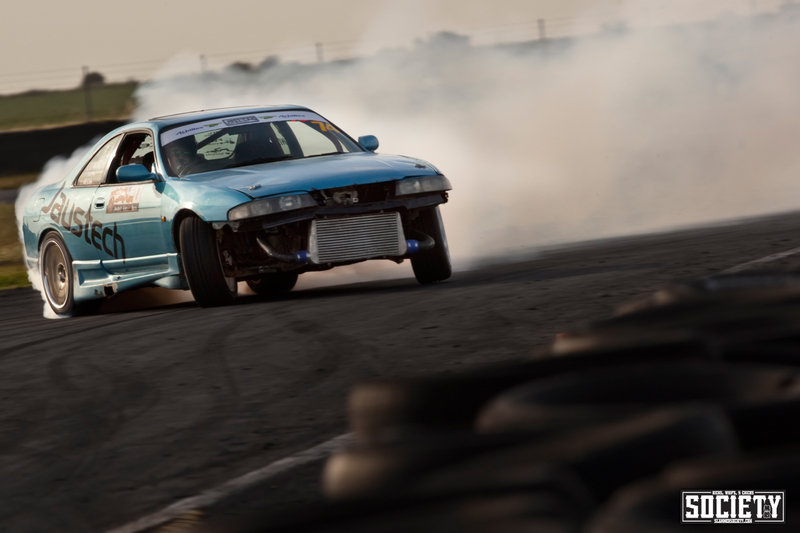 As we headed into May, the drift community was in a spin as the biggest event to ever hit our shores was just around the corner. 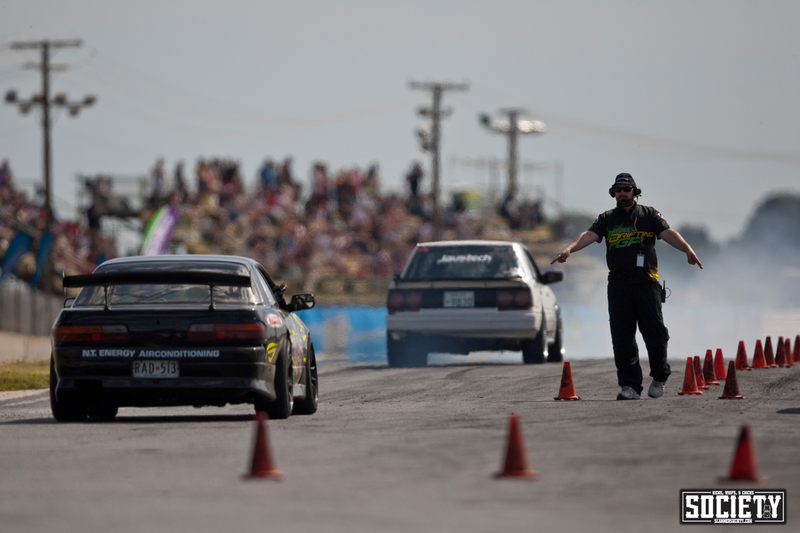 The Australian Drifting GP and the first ever, Formula Drift Australia. 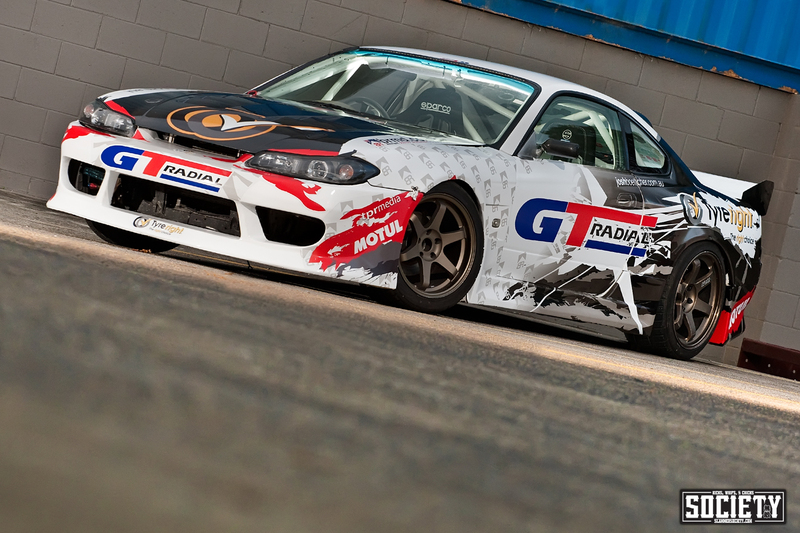 Josh Boettcher launched his new S15 livery two weeks before the event, we made sure to get a few shots while it still looked like new! 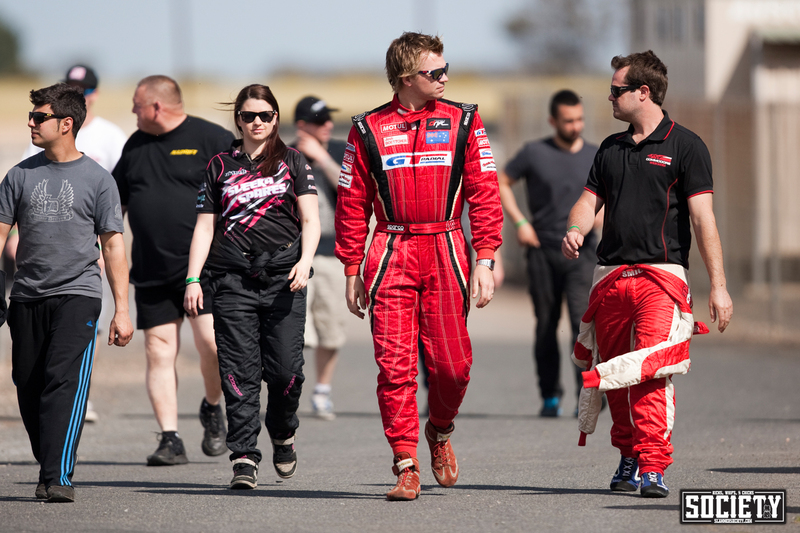 The ADGP / Formula Drift Australia weekend was an incredible event to be a part of. 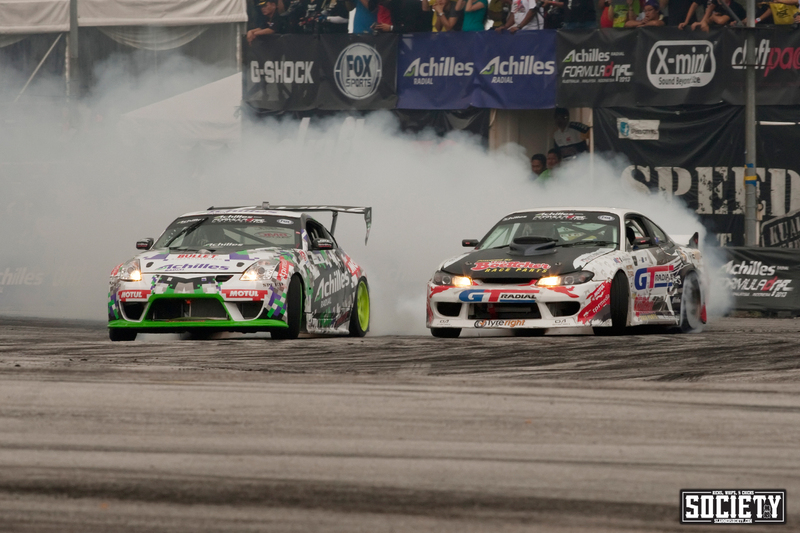 Having been to Formula Drift Asia twice, I knew the scale of the spectacle we were about to witness. 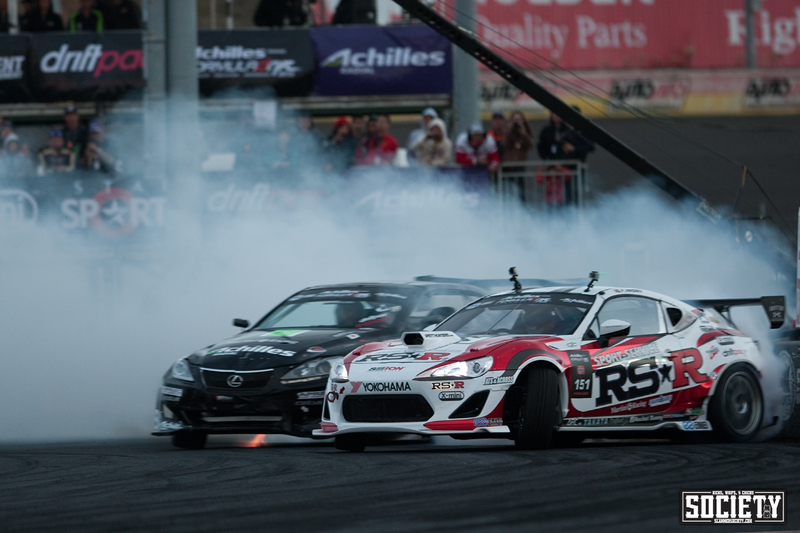 With names like Fredric Aasbo, Mike Whiddett and Daigo Saito lining up, it was always going to be an incredible event. 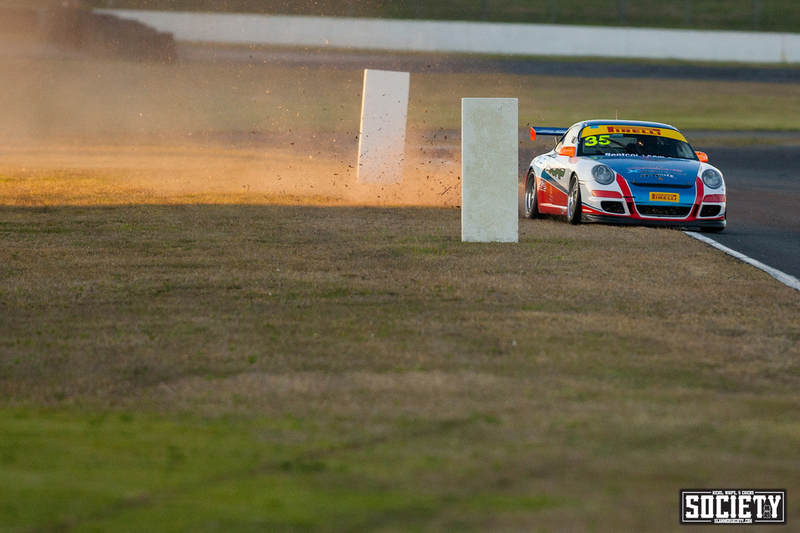 Tom Monkhouse showed his skills early on as he ran the wall and parted with a tail light. Below are a few of my favourite shots from the event. 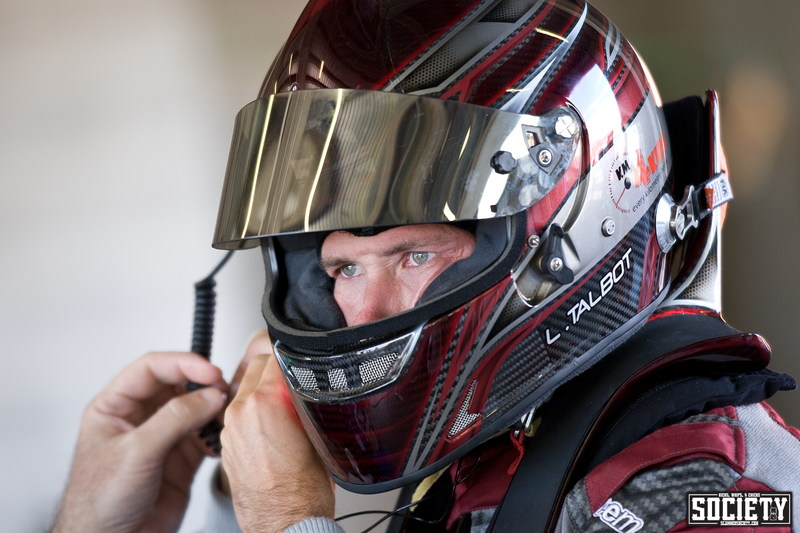 Queenslander Dan Kenneally keeping it stylish in his Hog Helmet! 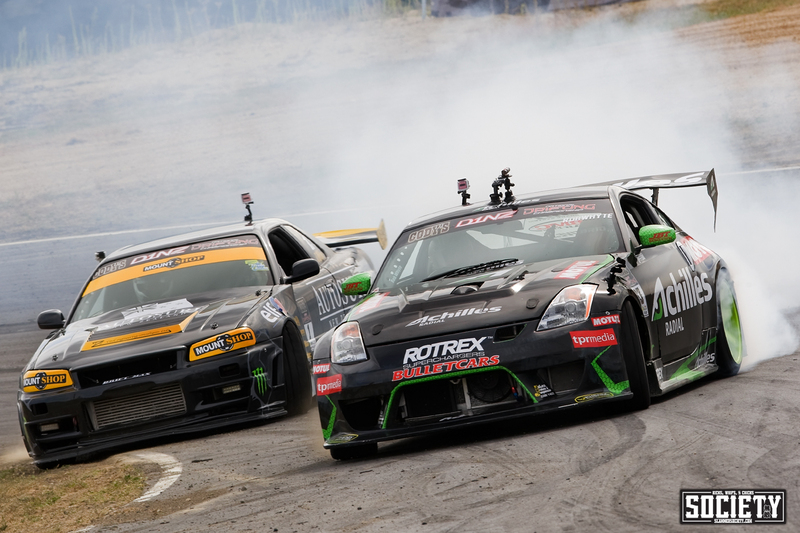 Saito vs Aasbo and wastegate flame! 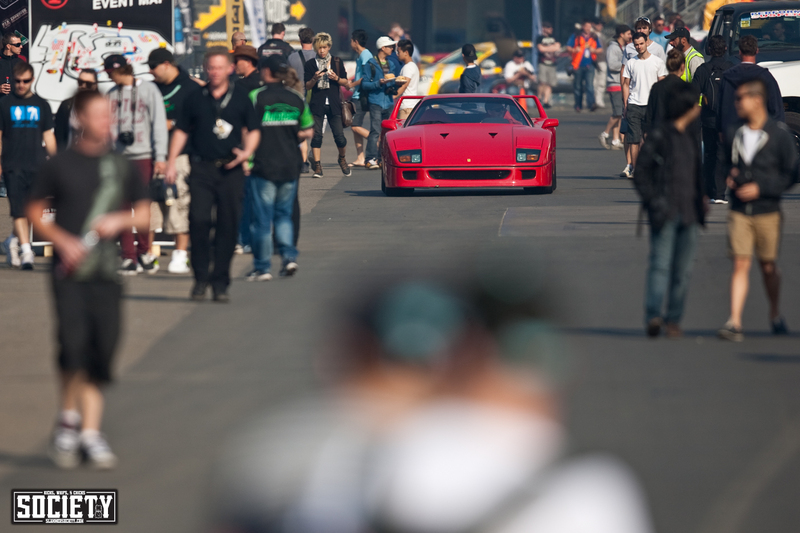 The MadBull, what’s not to love? 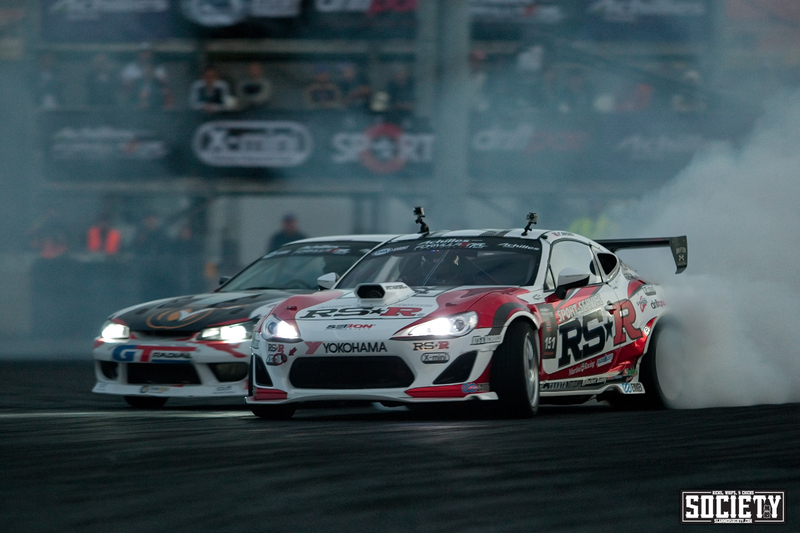 Rob Whyte drifting with FD champion Daigo Saito. Ryan Cummings also dropped his new livery that really stood out in the field! 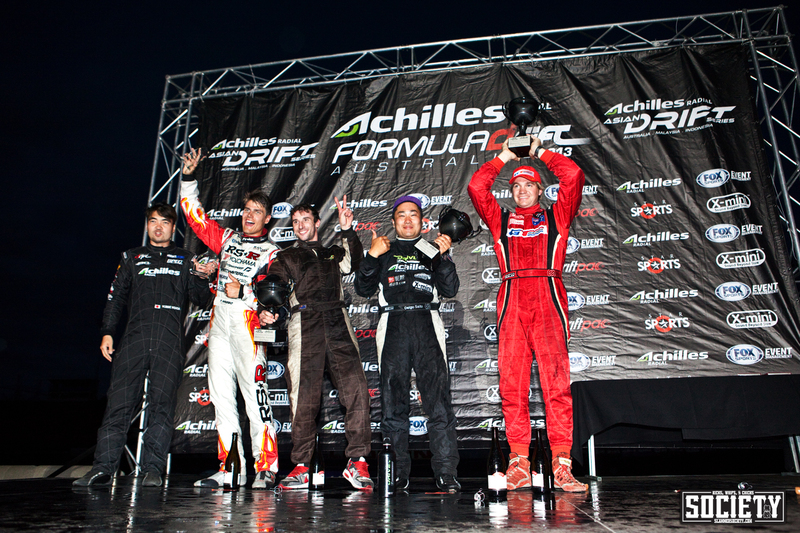 With two Aussies on the podium behind the powerhouse that is Daigo Saito, Tom Monkhouse took out 2nd place and Josh Boettcher in 3rd, it was a incredible finish to the very first Formula Drift competition on Australian soil. 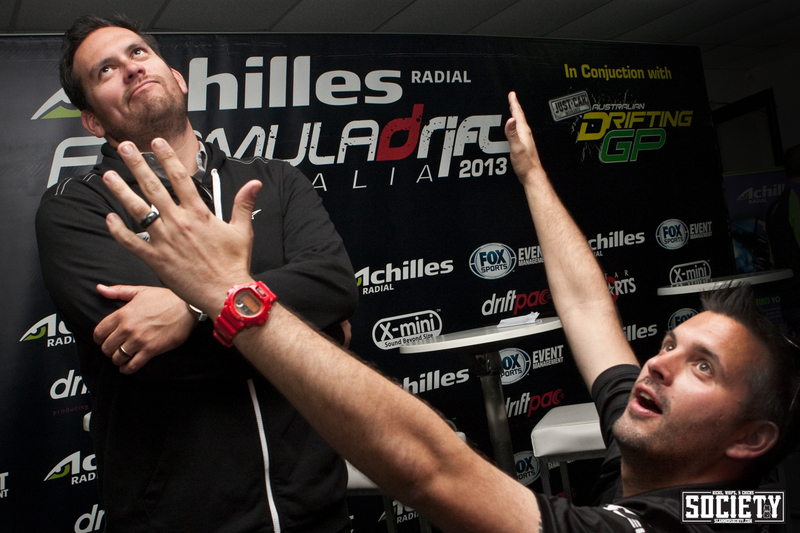 Everyone got to meet their Formula Drift idols, as Andrew Hawkins the voice of ADGP bowed down to the voice of Formula Drift, Jarod DeAnda. 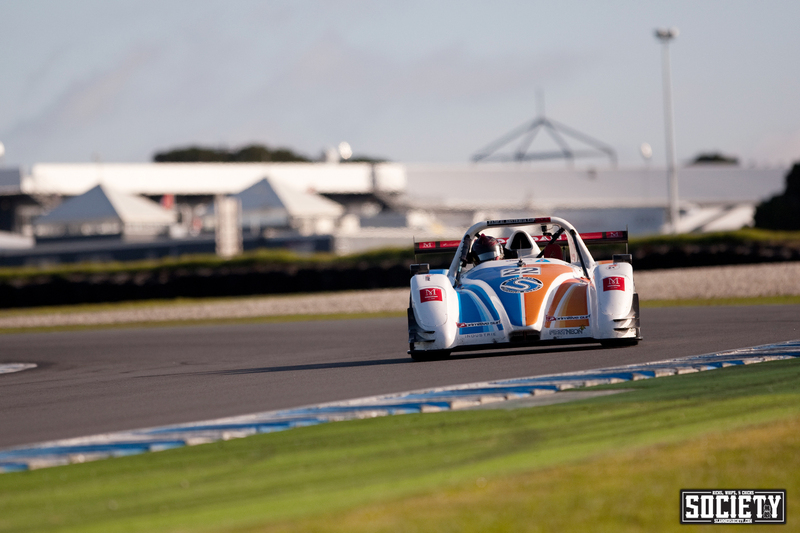 The following weekend it was back on a plane to Melbourne as we headed to Phillip Island for round three of the Radical Australia Series. It has been a number of years since I have been to the circuit, but it never fails to stop you in your tracks with its sheer beauty. 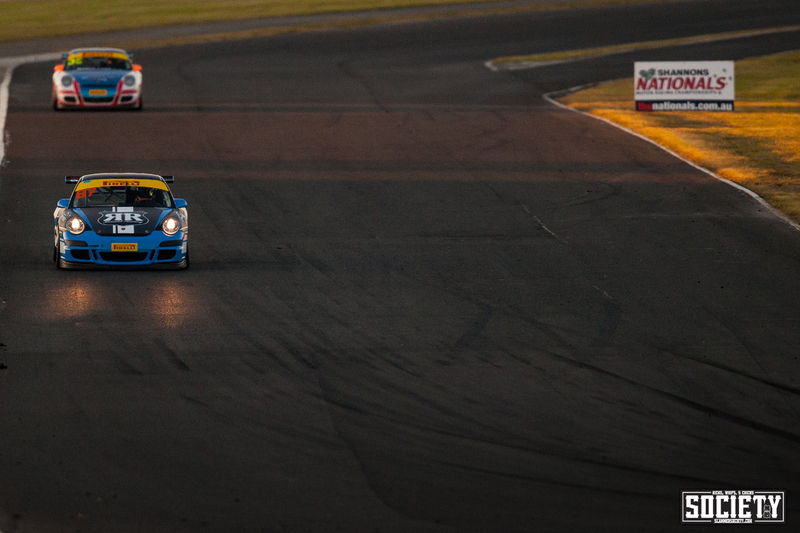 It really is an incredible track to photograph. Just metres behind this stunning view is the track itself. 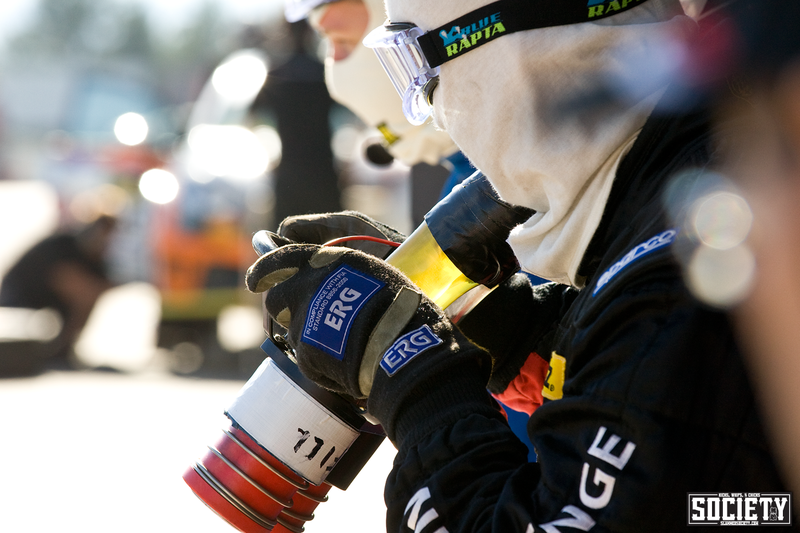 The view feels a million miles away in the pits, as the team prepare for the job at hand. 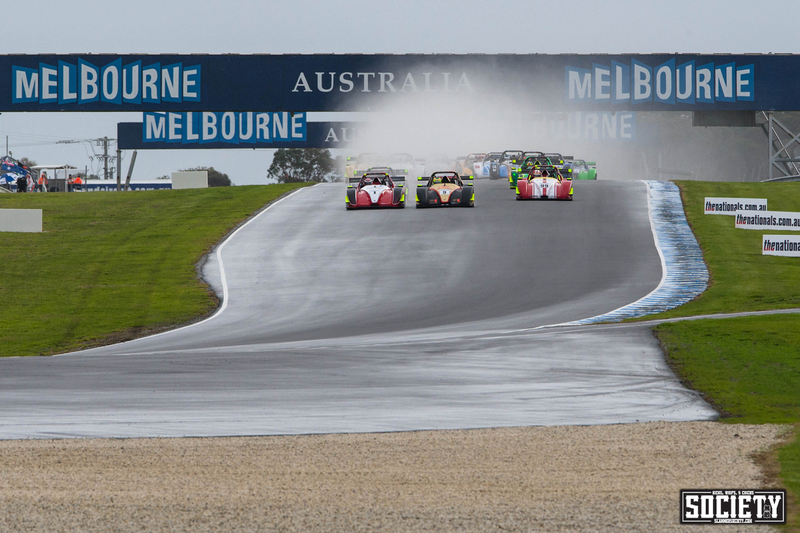 We experienced all the seasons as the track is well know for, as it went from hot and stunning to freezing, raining and windy, but it made for some great action on track. 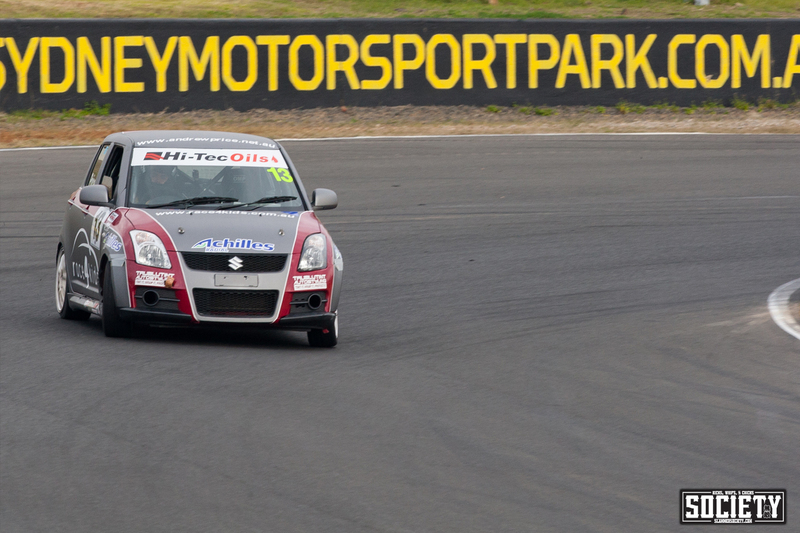 Liam secured another class win, putting him in serious contention for the championship. 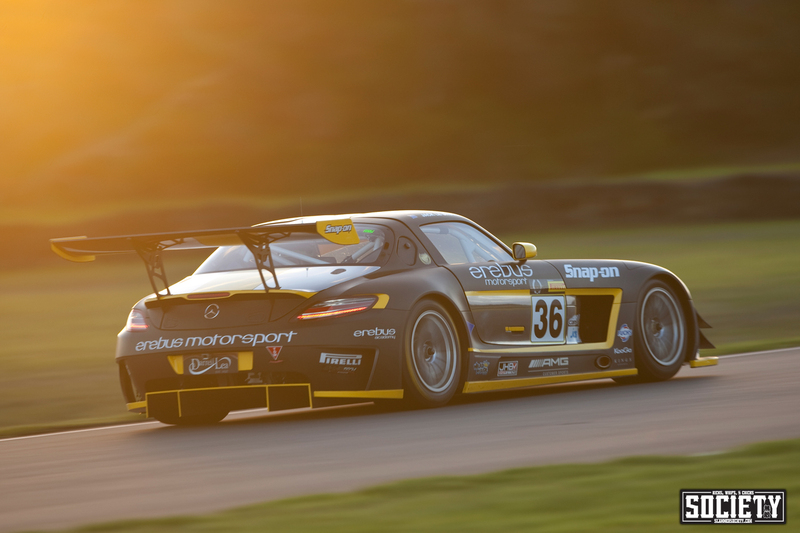 The Erebus Motorsport SLS AMG is still one of my favourite cars in the GT class, this was shot in the final laps of competition with the sun disappearing over the horizon. 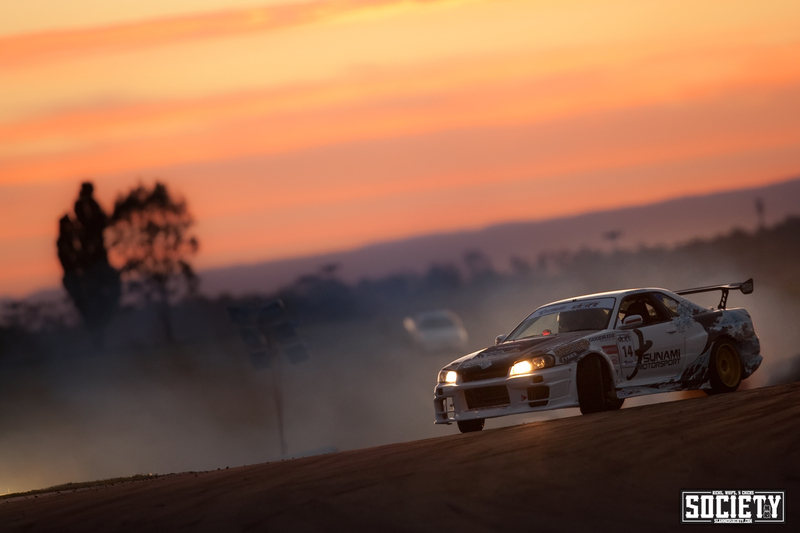 Another few weeks and it was back to Queensland Raceway in June for the 2 Days of Thunder when local driver Mick O’Shea was running his heavily developed R33 Skyline. 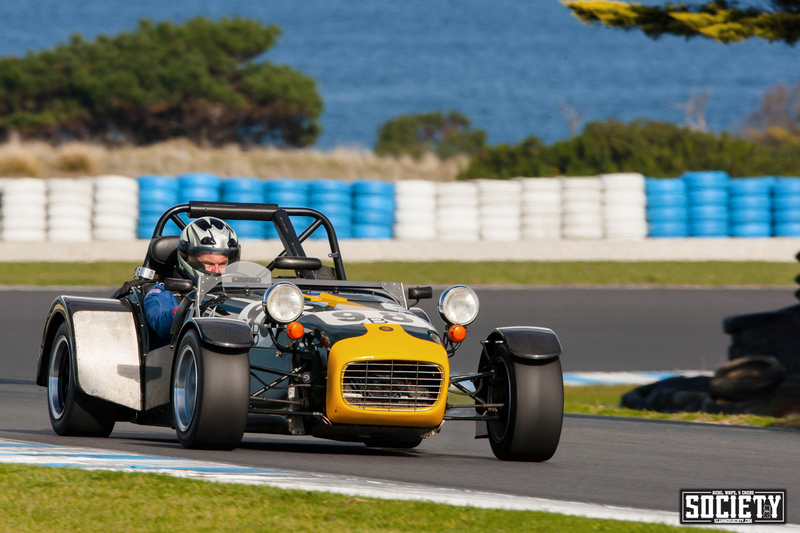 His first year in the series, Mick had found himself at the pointy end of the field, but he secured his first round win over the weekend. 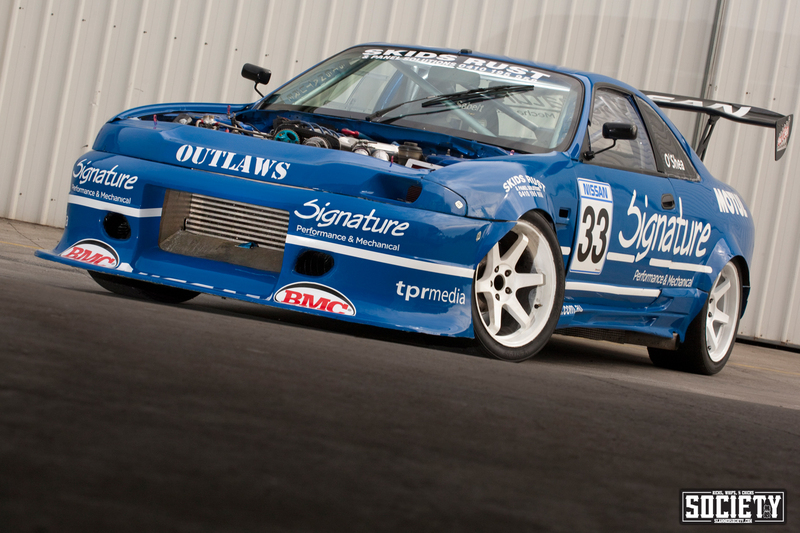 One of the most striking features of Mick’s R33 are the coolers at the rear, that have been moved to achieve an almost 50/50 weight distribution in the car. As we headed into the second half of the year, there was still plenty more to come. 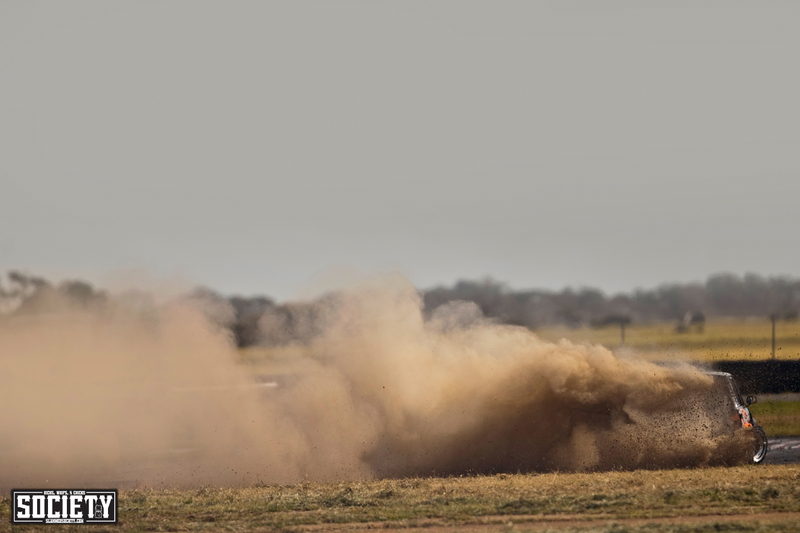 However, with a welcome break between major events, I headed back to our local grassroots track Archerfield to shoot some drift practice. It’s still great to go back to where it all began. 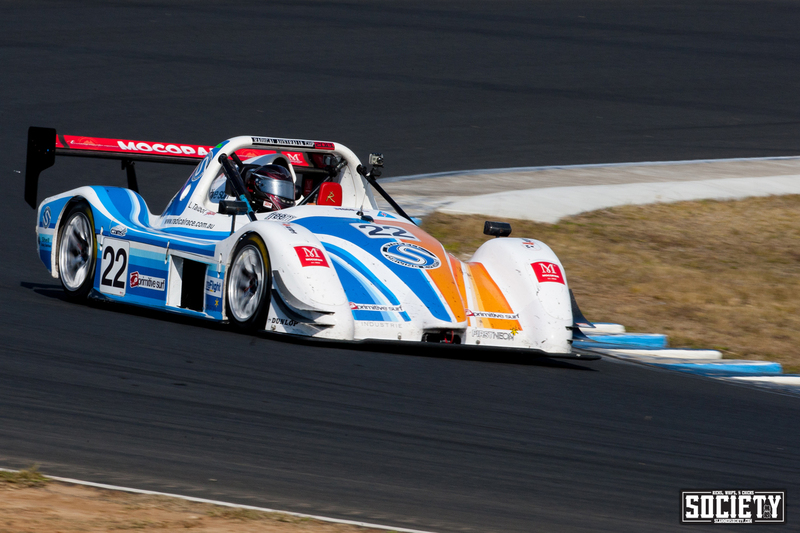 The next stop was back to Sydney Motorsport Park for Round 5 of the Shannons Nationals Series where Liam was continuing his campaign in the Radical. Being my first year following the Nationals, one of the classes that really stood out was the Swift Series. Being a front-wheel drive with only modest power output, the drivers push these cars far beyond their limits to get the most out of them. 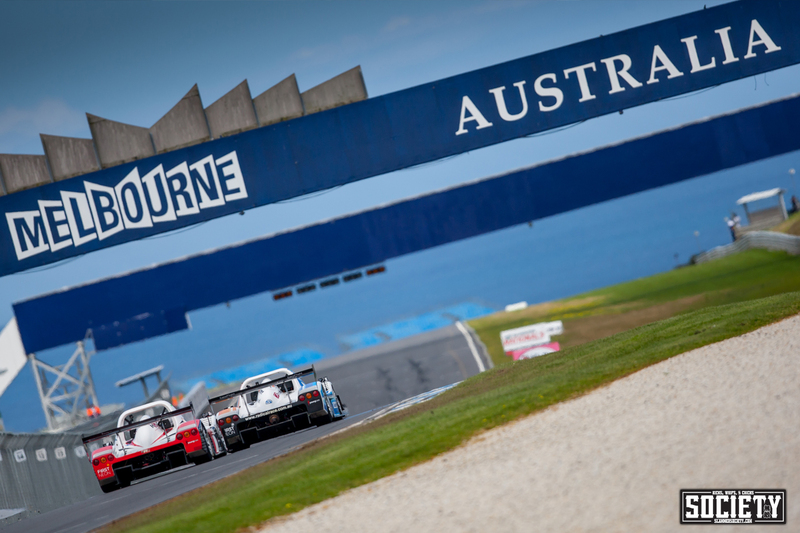 The Carrera Cup is one of my guilty pleasures, even though I am there to shoot the Radical, I am a big Porsche fan and really enjoy shooting the cup cars. 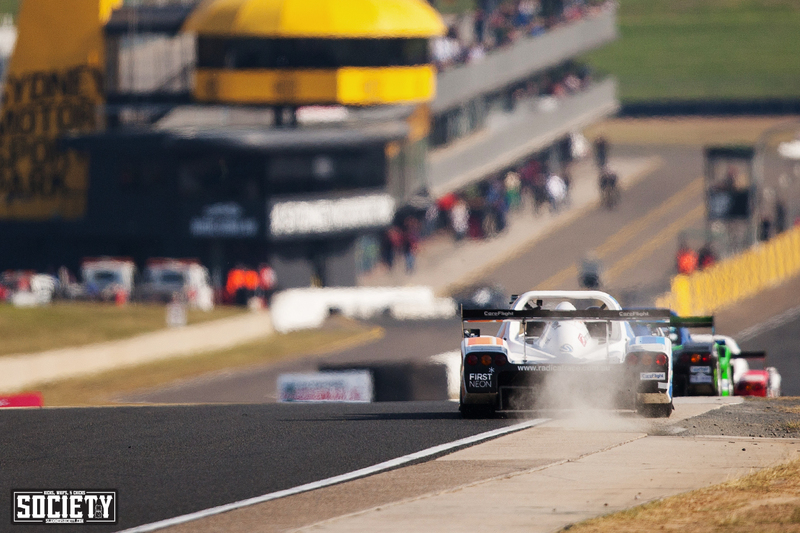 They can quickly step off line when pushed past their limits, making some difficult moments for the drivers. 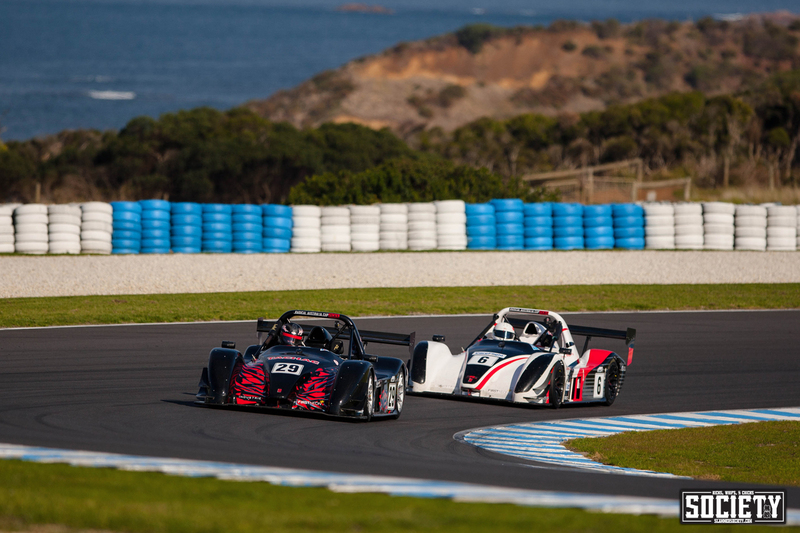 Back on task with the Radical series and Liam yet again secured another podium, truly breaking new ground in his rookie season. 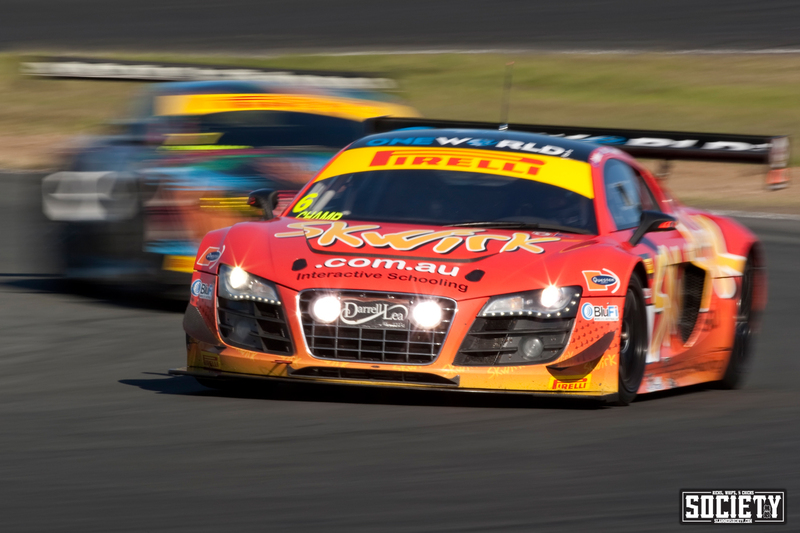 The next round of the Shannons Nationals series was a bit closer to home at Queensland Raceway and Liam stepped up into the GT Class for the round behind the wheel of an Audi R8 LMS Ultra. 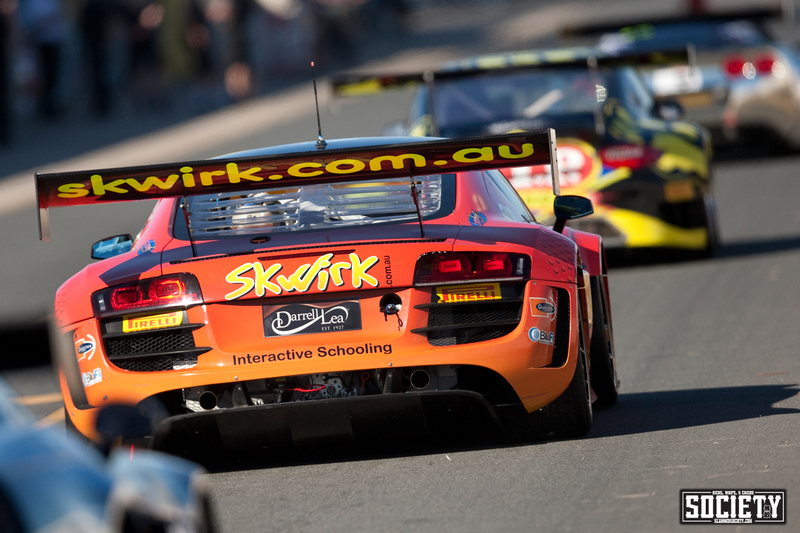 It took Liam a few laps to hit his rhythm in the much more powerful Audi and feeling out the aero package on the car. 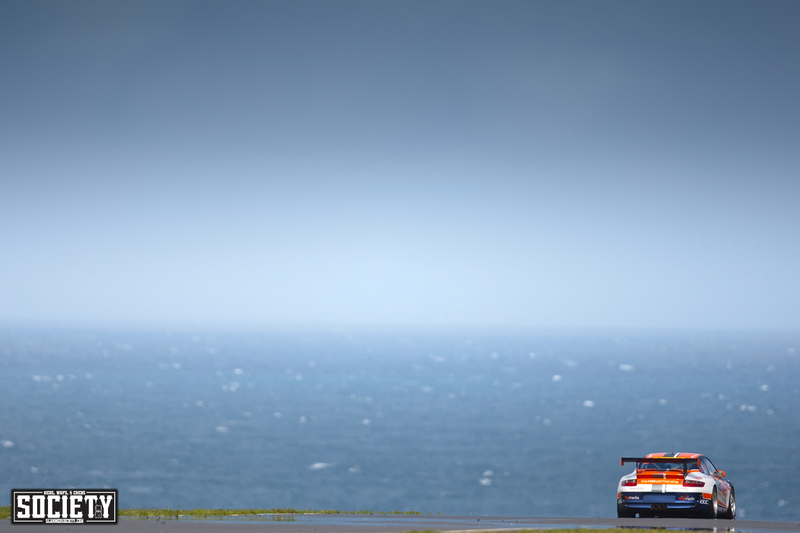 It wasn’t long until he was unleashing the full force of the R8. 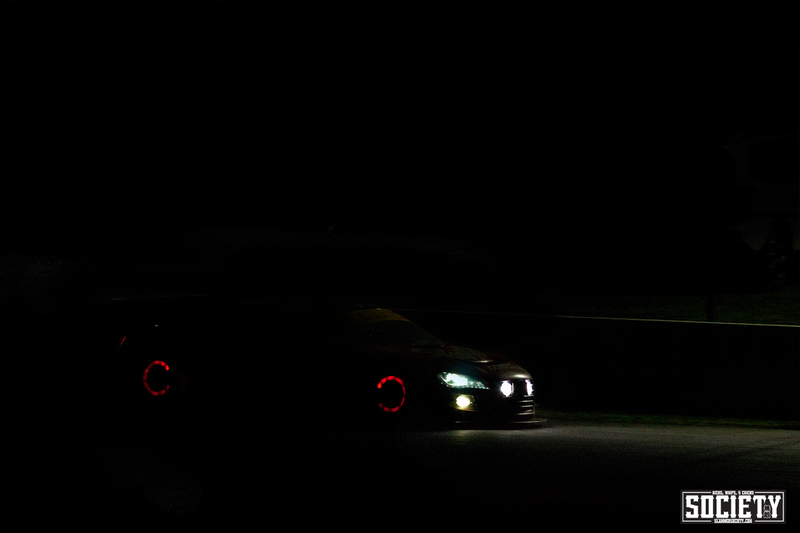 The round included a night race, the first of it’s kind that I’ve seen at QR. 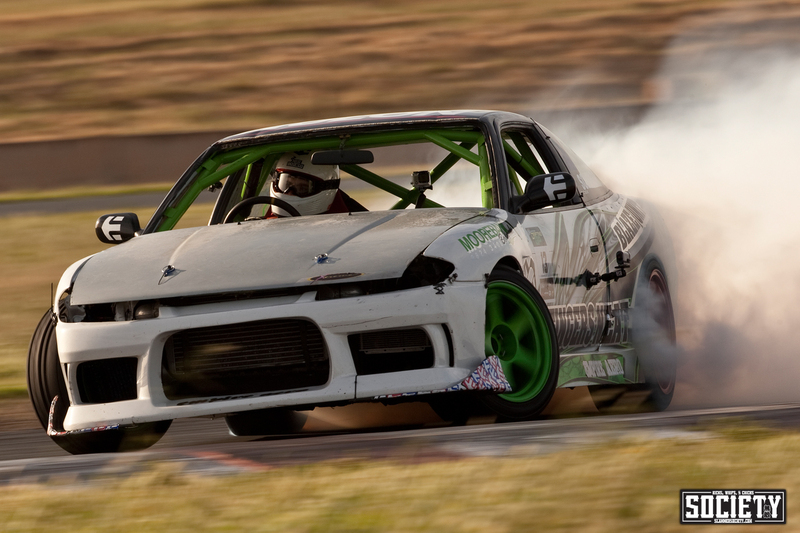 At the end of July, Josh Boettcher has just finished getting his 550HP 2.2L SR20 rebuilt and was ready to be sent overseas for the next round of Formula Drift. 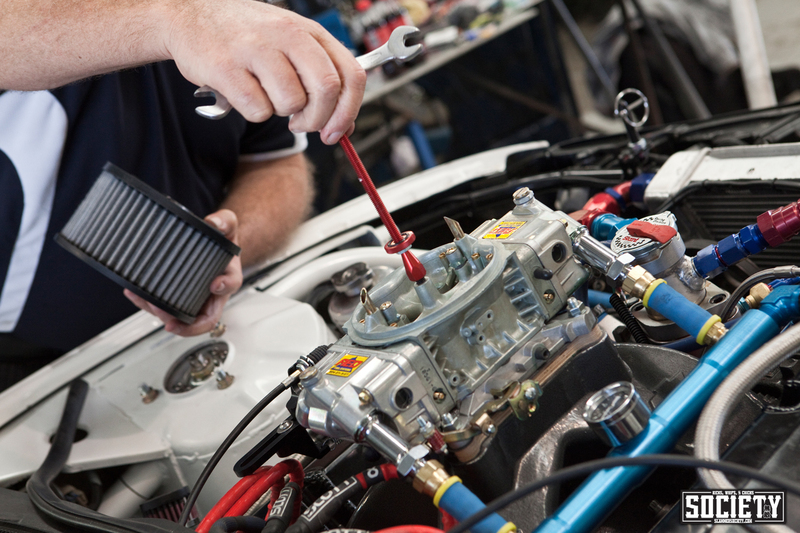 After the engine had been installed and started, the engine suffered complete failure as an oil line had been incorrectly fitted and the engine imploded. With only fourteen days until the shipping container left our shores, Josh undertook one of the most insane rebuilds I have ever seen. 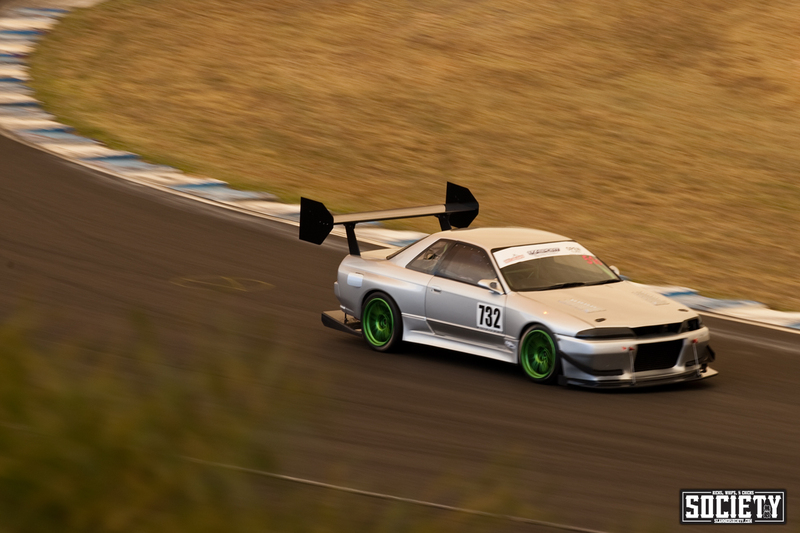 Rather than fixing the SR, he was able to secure a 850HP 7.2L V8 and began the immense task of fitting the new engine and gearbox to his S15. 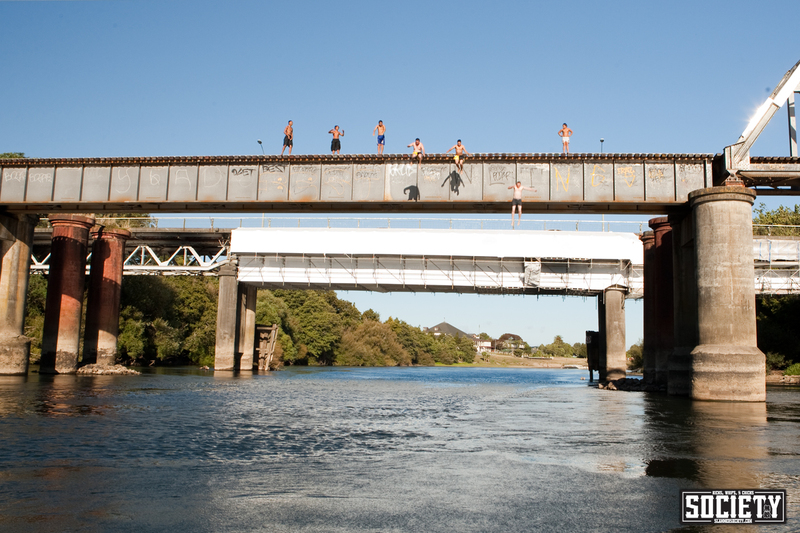 This was one of those times that really demonstrated what is possible when you commit to a task. They were still bolting everything together as the truck was parked outside to collect the container. This was down to the wire like I have never seen. 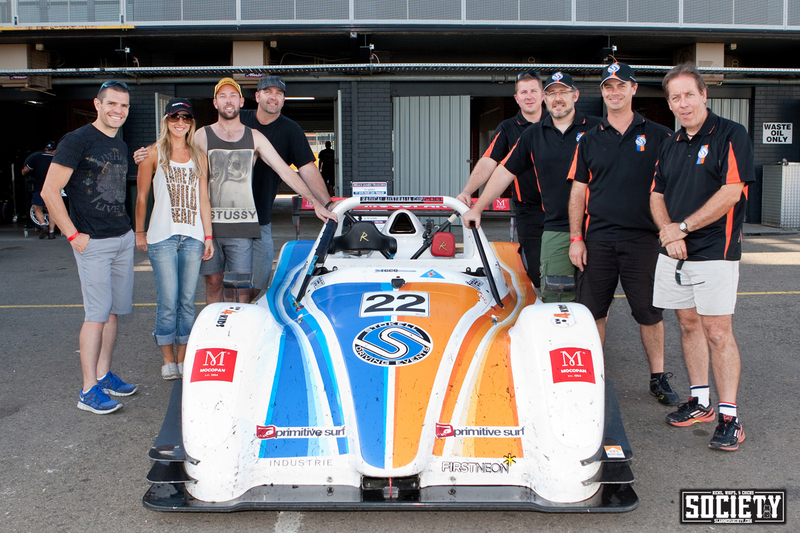 The entire team were absolutely shattered, having worked day and night for two weeks, but they got it done. 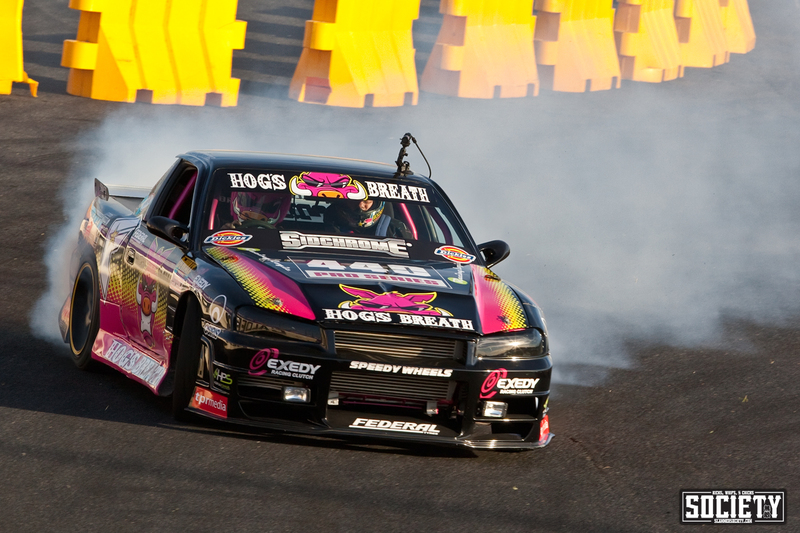 August quickly arrived and I was invited by Josh Boettcher and the GT Radial Drift Team to join them at Formula Drift Malaysia. 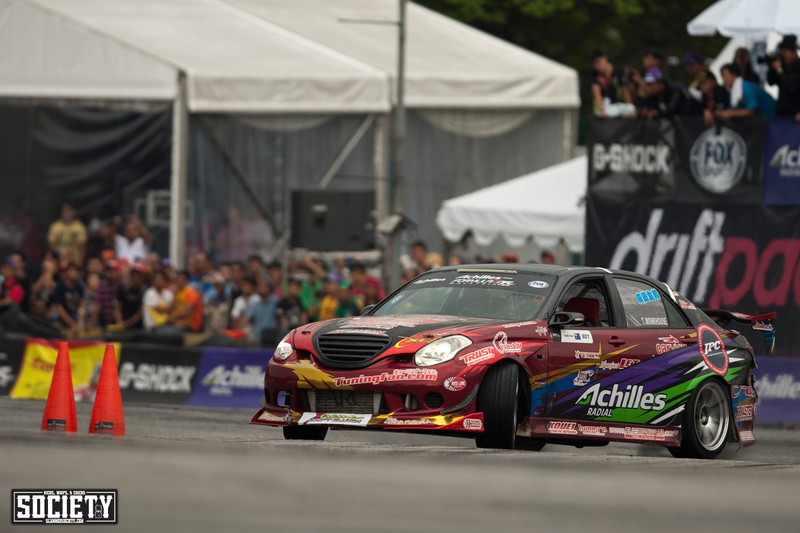 It was a special occasion, as Rob Whyte from the Achilles Radial Drift Team was invited to compete at the international event as well. 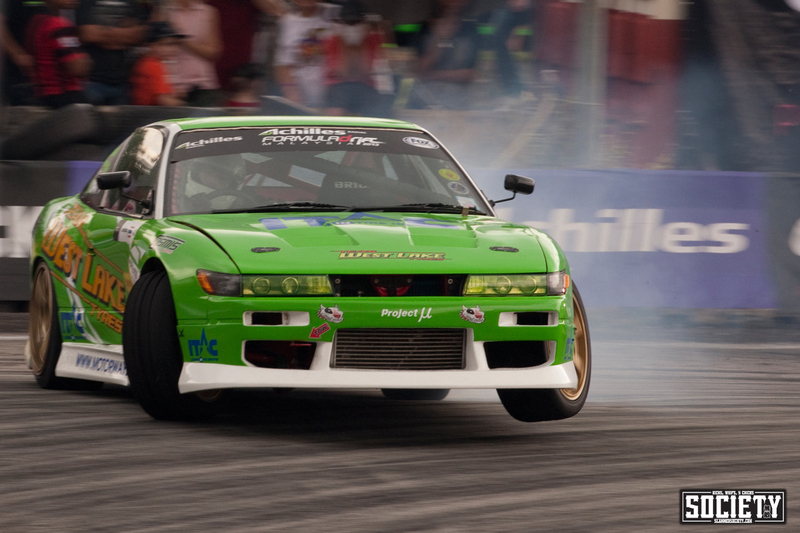 I have been working with Rob since 2009 and Josh since 2010 and they are the guys that got me involved in drift. 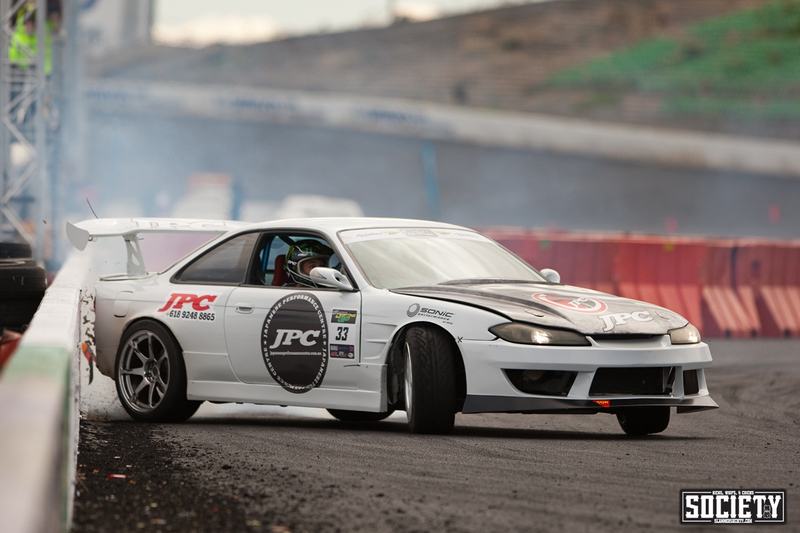 Arriving at the track, Josh and his team unpacked the S15 and prepared for it’s first ever test run. 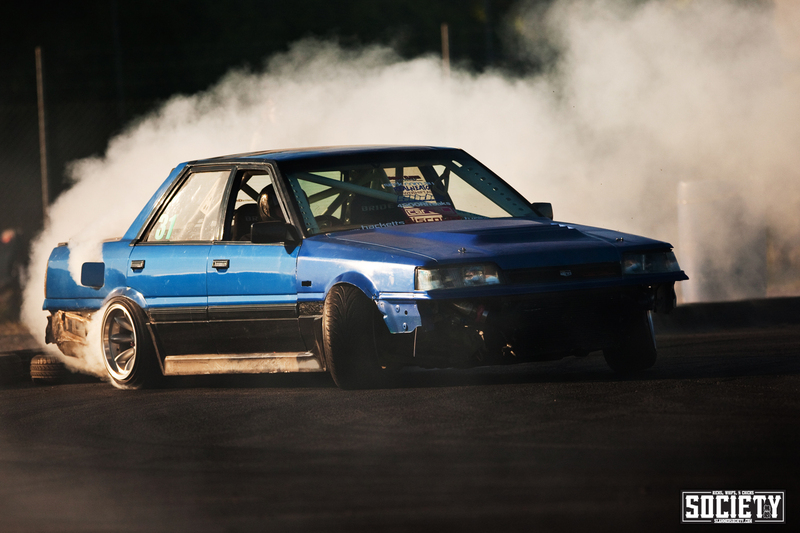 This was the very first drive as Josh discovered what was possible with 850HP. 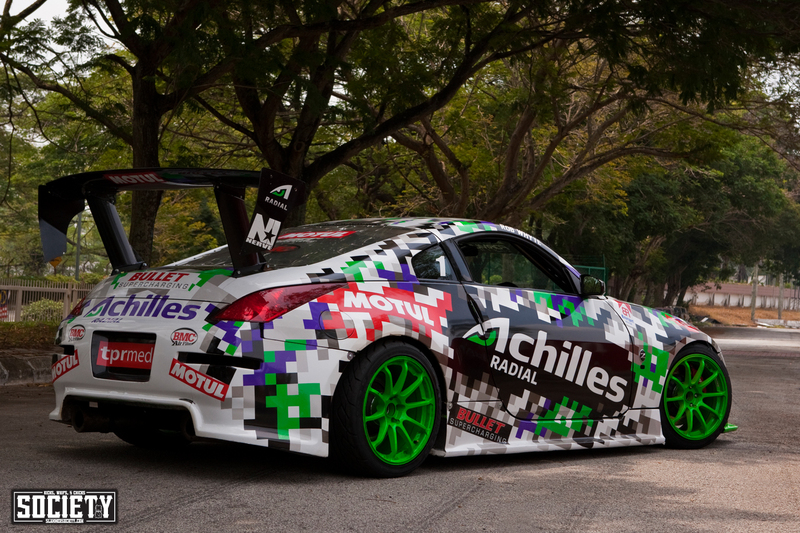 Rob debuted his new look Nissan 350z that was now packing a six speed sequential Holinger gearbox. 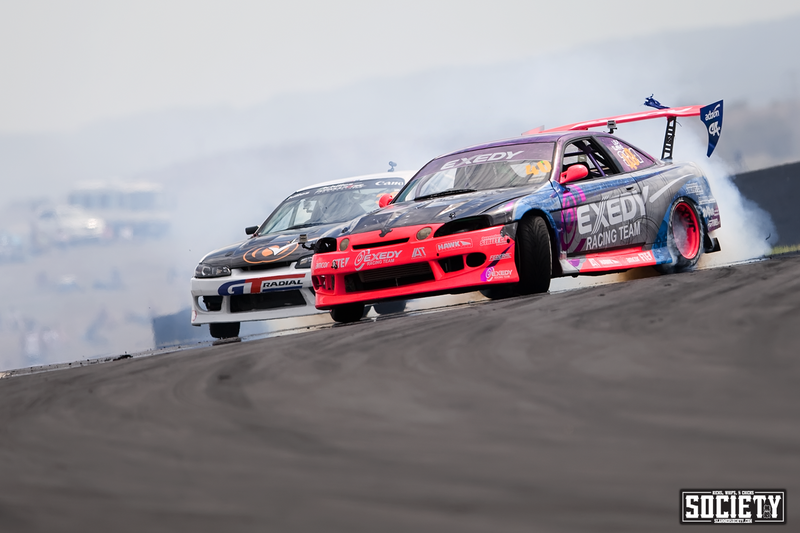 It’s always awe inspiring to be at any FD event, with the level of talent across the drivers and the professionalism of the event itself. 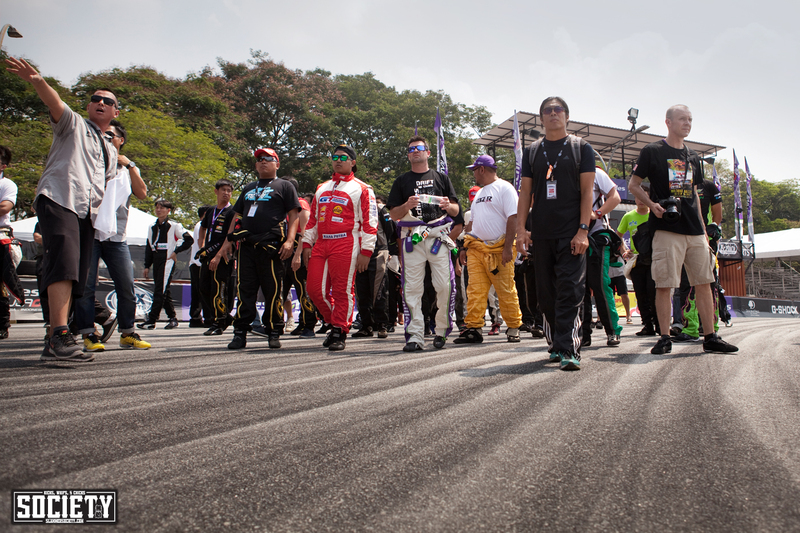 The event quickly got underway with the track walk in the very hot and humid conditions. 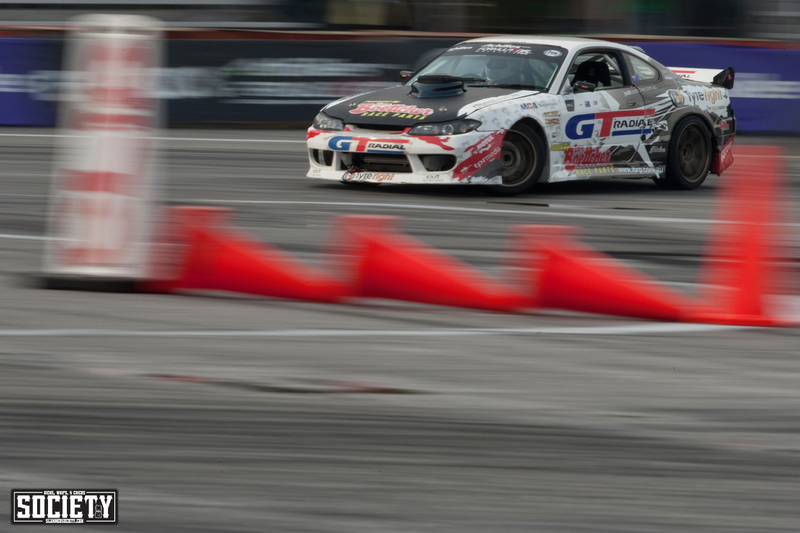 Being his first international FD event, Rob took the time to walk the track again, with sharp rise and fall across sections and transitions, it is a fast, technical track. As drivers hit the track for practice, they started to learn the lines. 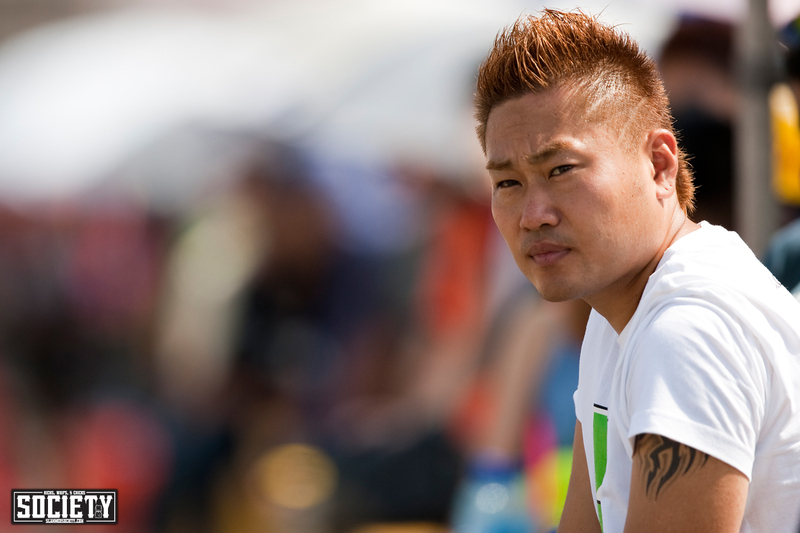 As always, Saito was tearing it up. 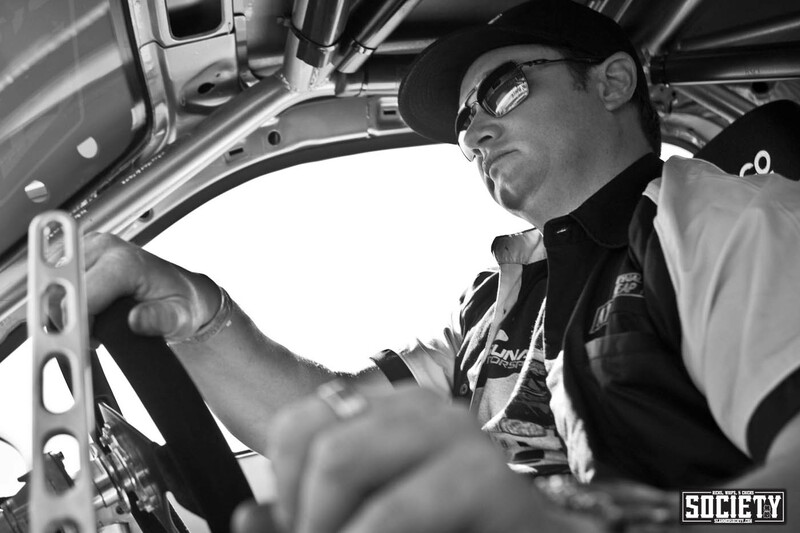 When he wasn’t behind the wheel, you’d see him studying other drivers on track. There was certainly plenty to watch! 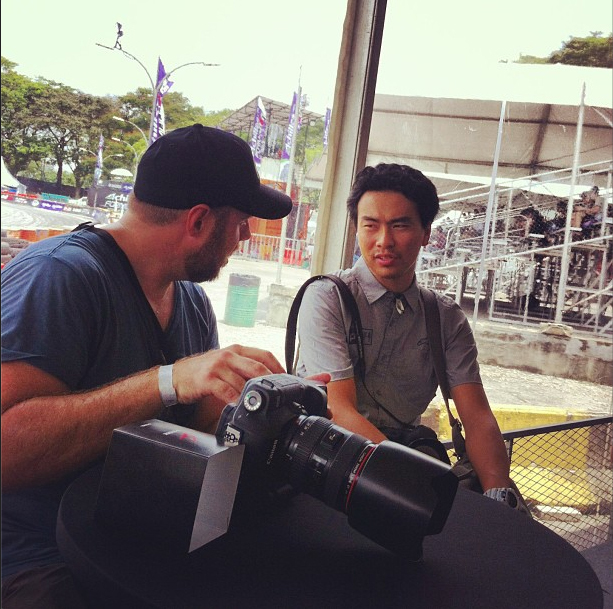 Rob and Josh ended up facing off against each other in the top 16 battles. Not the outcome they were hoping for, but it created the special opportunity to catch them in action together at FD. 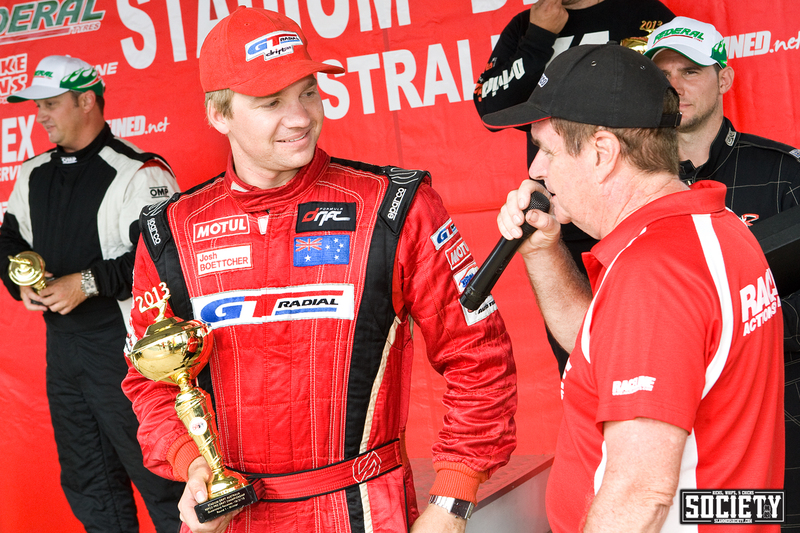 Australian Tom Monkhouse did the unthinkable behind the wheel of a 2JZ powered Verossa with D1GP heritage, knocking out Saito and ending up on the podium in second place. September kicked off with a trip to Powercruise with Trent and Tessa Whyte from Mercury Motorsport and their insane R34 GT-R that consistently produces over 1000HP at all four wheels and runs a sub 10 second pass in full street trim. 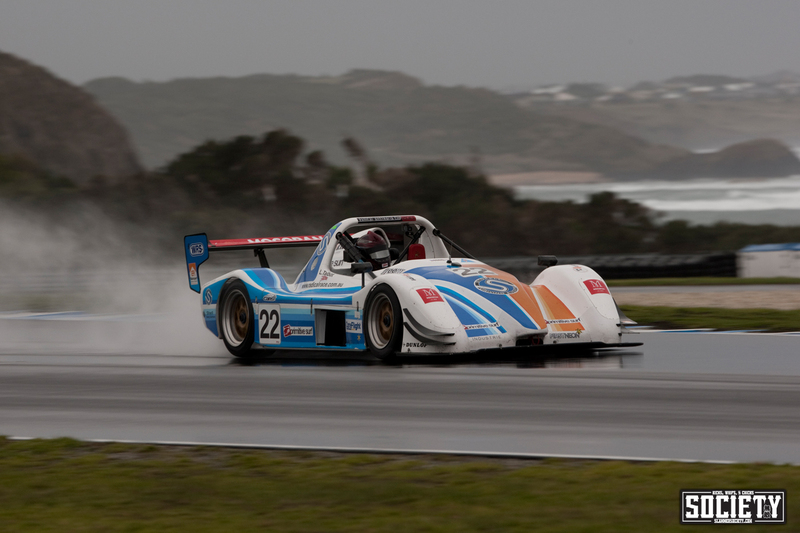 Later in September, it was back to Phillip Island for the next round of the Shannons Nationals to cover the Radical round with Liam. Having a championship within reach, this was another crucial round. 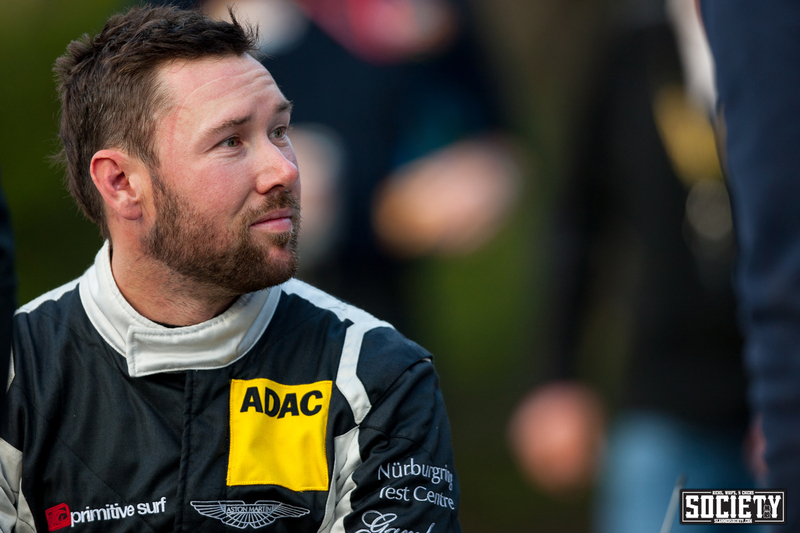 Difficult weather conditions made for some tough racing during the two day event. 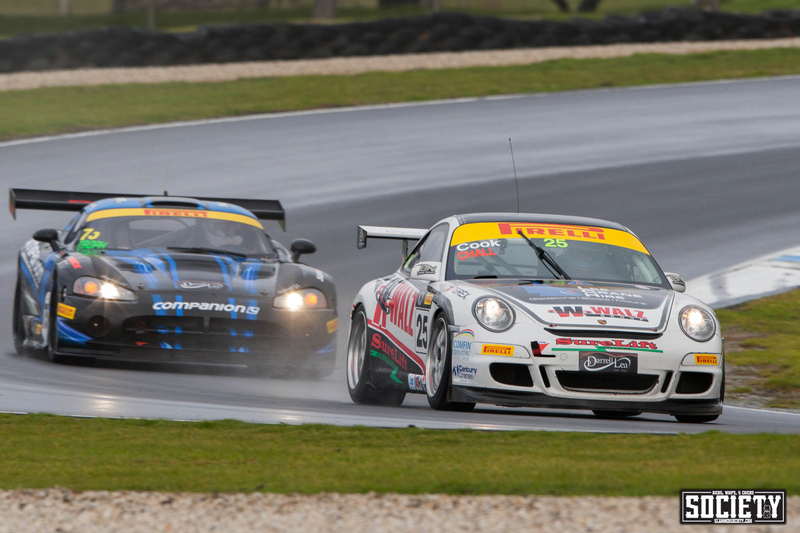 This was one of my favourite shots from the weekend, it had been pouring rain and I’d just got the rental car bogged in the mud, but the sun came out for about 10 minutes and I captured this shot of a Carrera Cup car going over the crest into turn one at the iconic Phillip Island circuit. It started pouring again shortly after! 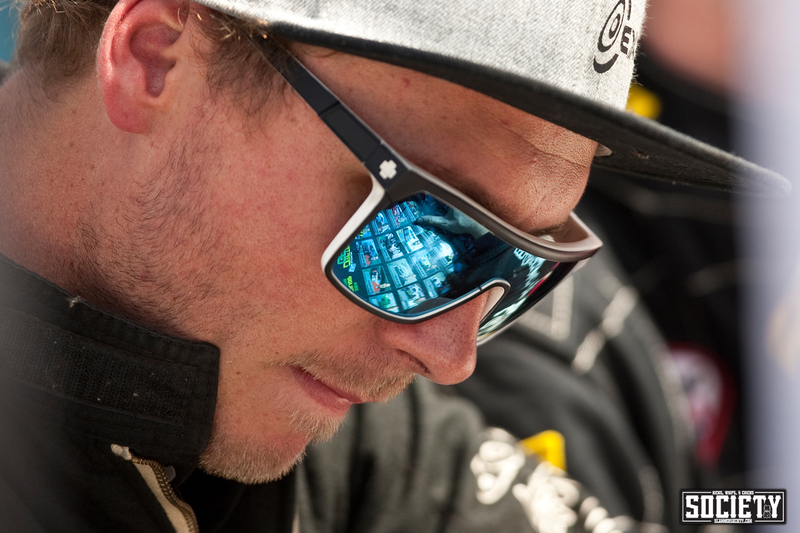 The conditions really take it out of the drivers and after the race there is a mix of excitement and pure exhaustion. 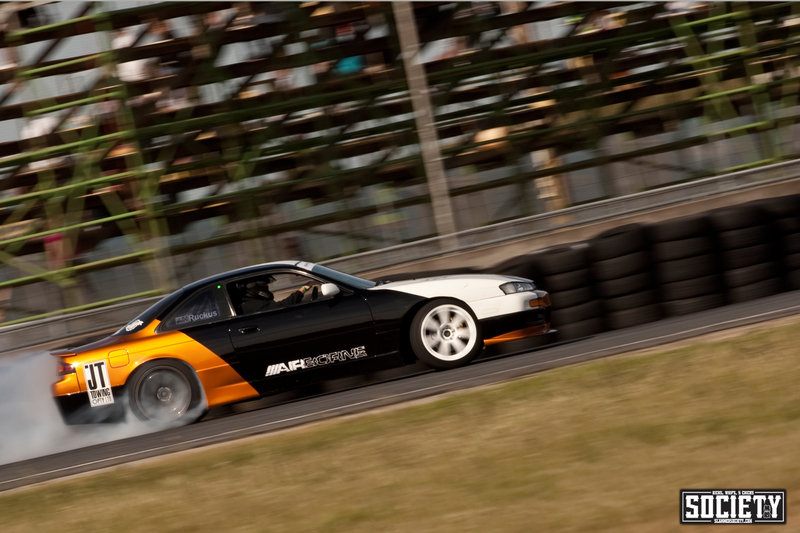 In early October, the Australian Drifting GP kicked off for their new summer season, with round 1 held at Mallala in South Australia. It had been a long off season as ADGP transitioned from a winter season to a summer season. It was great to be back! 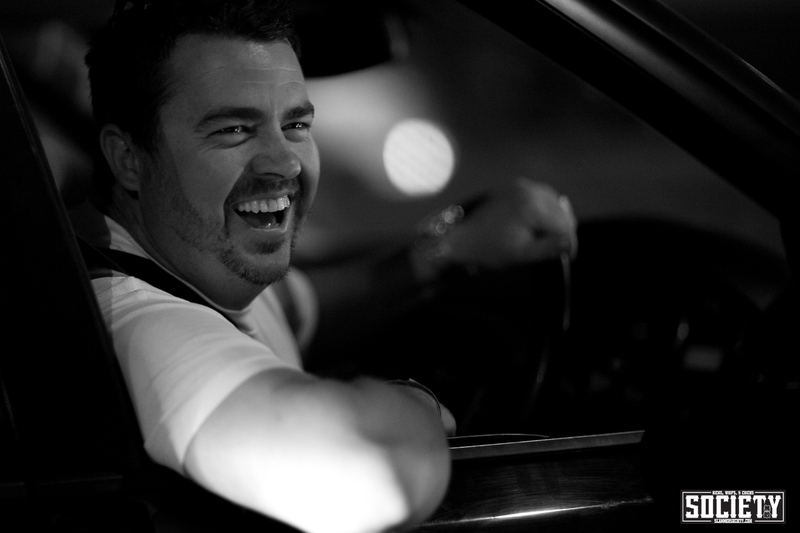 Chris Forsberg made the trip over as a guest judge. Totally starstruck again! Each year, the level of talent and the quality of the builds is stepping up. 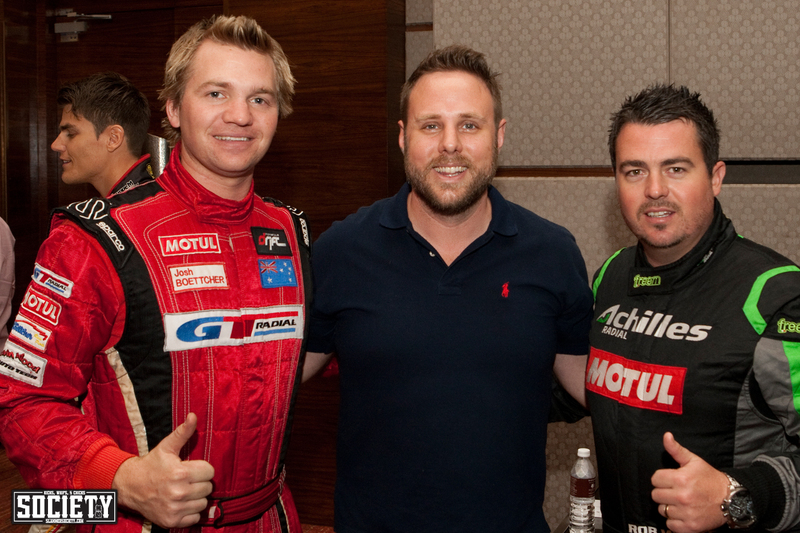 With drivers from around Australia going head to head for the championship. 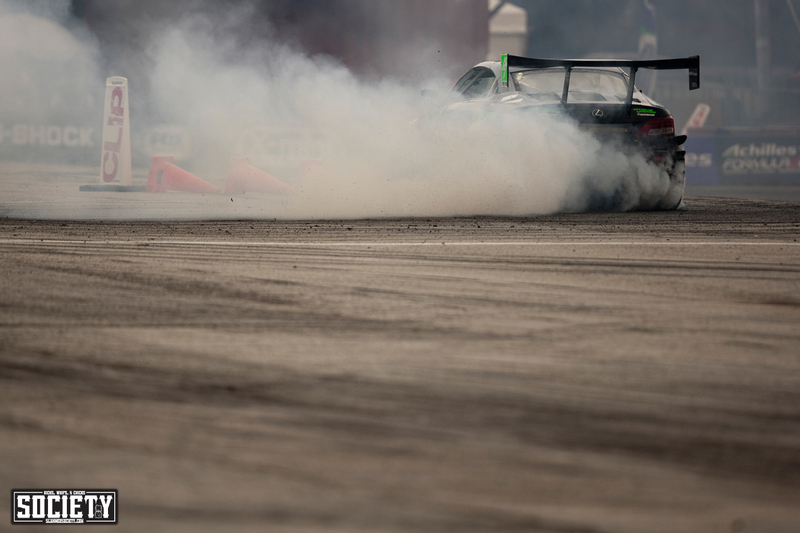 One of the reasons I enjoy shooting drift so much, is that it creates spectacular photo opportunities. 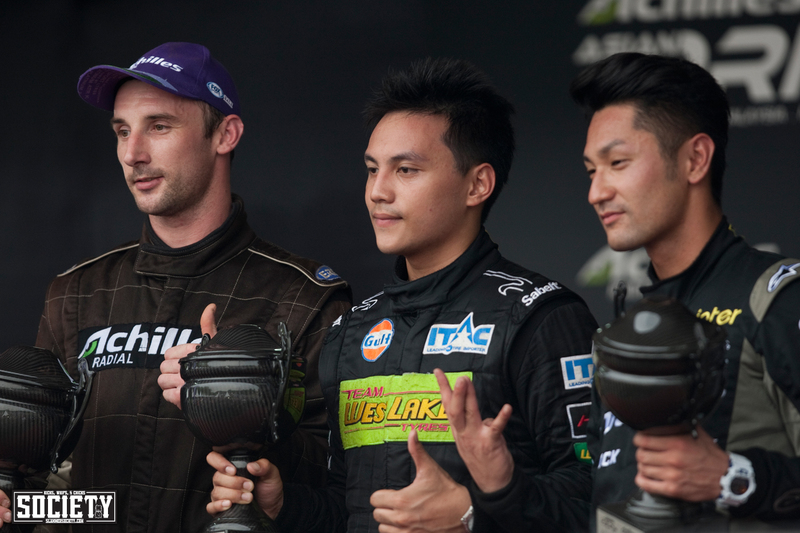 It was another big event for ADGP, with a full field of drivers and packed grandstands. With the growing popularity of the sport in Australia, the driver signing sessions are always packed. 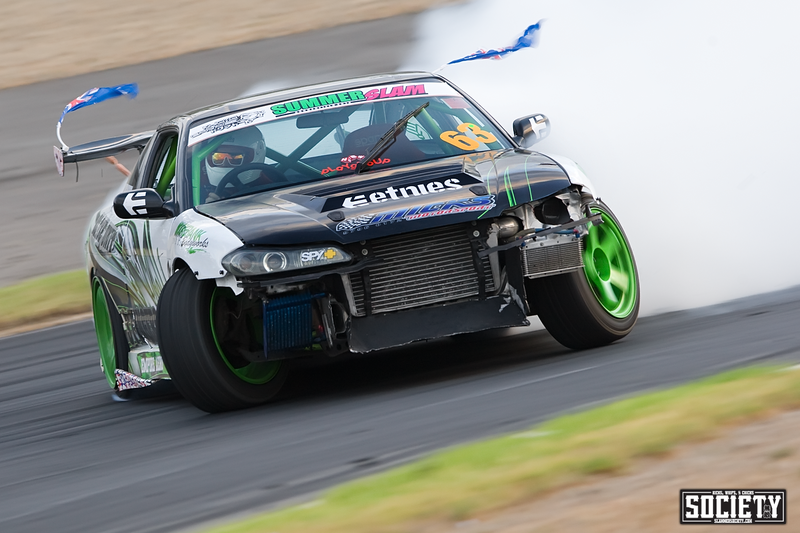 Levi Clarke debuted a V8 powered S15 at the event with absolutely massive amounts of lock, signs another poster for a fan. When it comes down to it, what’s not to love? Cars with plenty of individual style, loads of power and impressive driving to match! 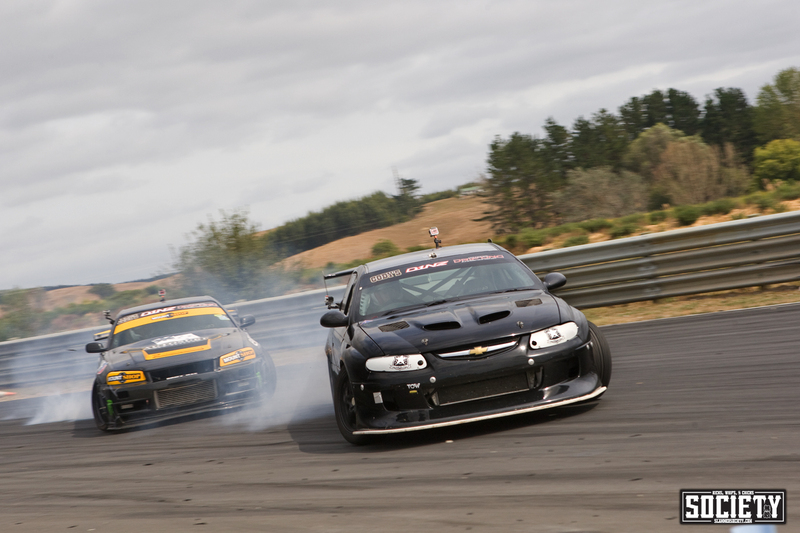 It was yet another amazing weekend of drift with friends, exactly as it should be. Here Rob Whyte trades friendly jabs with Josh Boettcher heading back to the hotel. There is never a shortage of friendly rivalry! In mid October was one of the biggest weekends of the year. 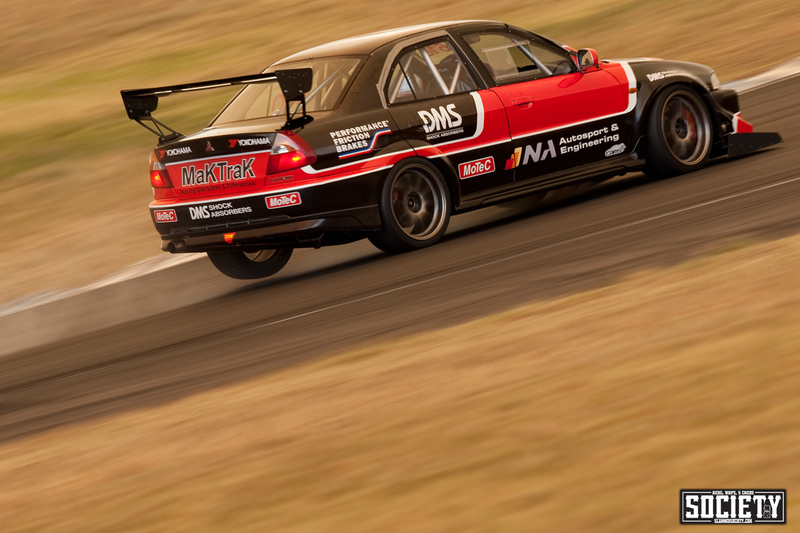 I travelled to Sydney on Wednesday to catch the first day of testing for the World Time Attack Challenge. 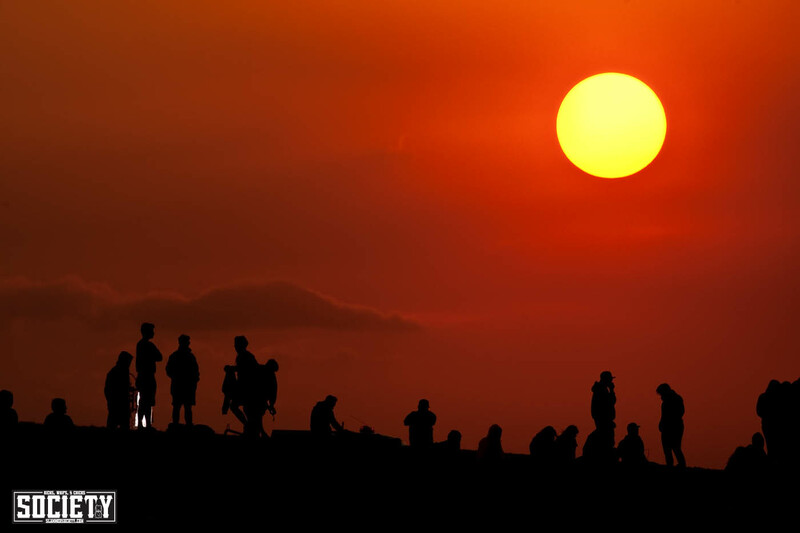 On that same day, the Blue Mountains were engulfed in terrible bushfires and the smoke billowing across the track was making it difficult to breathe. As it closed in, it look like armageddon. 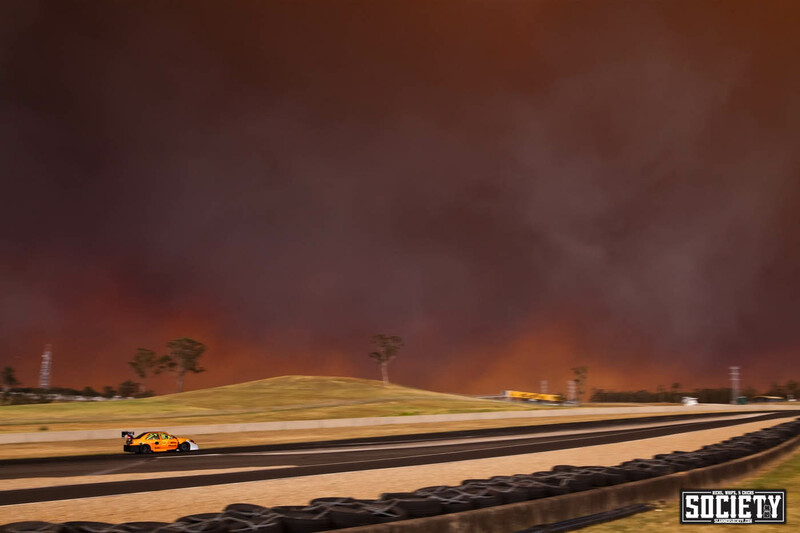 You can see the orange tint on the cars as the burning skies cast the most incredible colour. However, the terrible conditions created one of the most amazing sunsets I have ever witnessed in Australia. 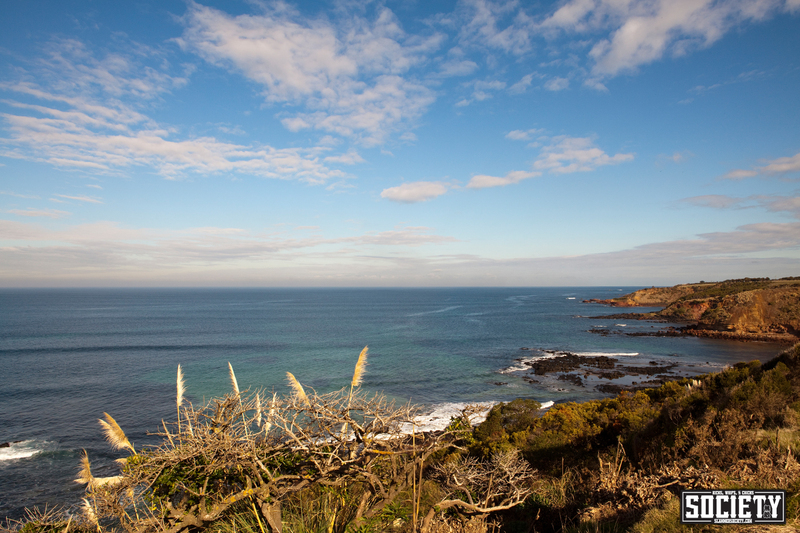 As the bushfires came under control, you would never have known the crazy conditions the day prior. All manner of cars arrived for the two day event. It was like watching the parting of the waters as this F40 rolled in. Everywhere you looked, there was something special to distract your attention. 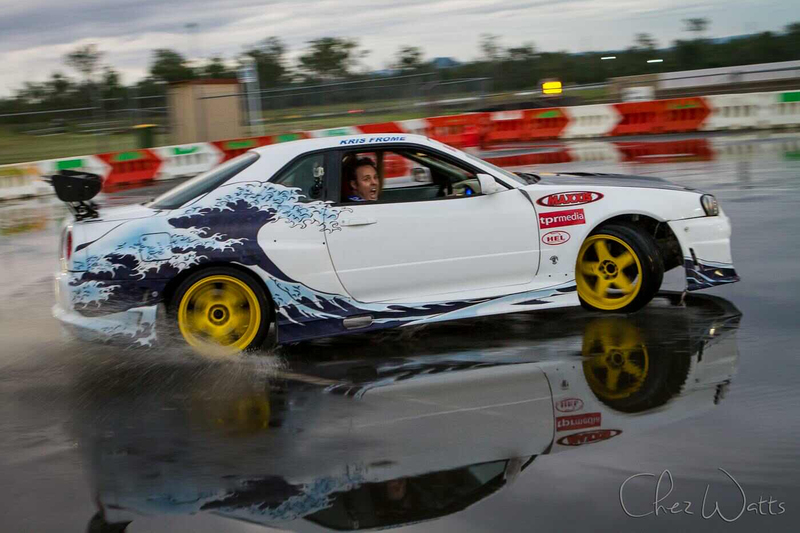 I spent the weekend with local Queensland driver Kris Frome, who was attending his first ever WTAC as a competitor in the Tectaloy International Drift Challenge. 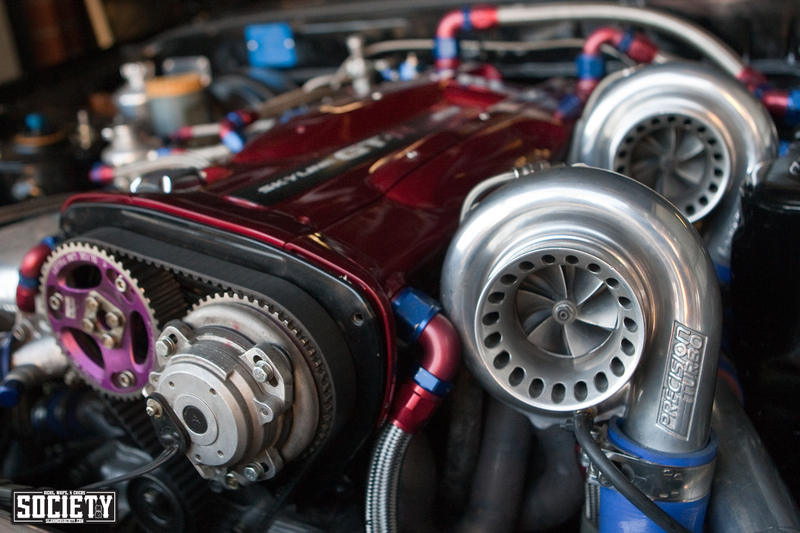 Kris has built a V8 powered R34 Skyline and her certainly made the best of the weekend! 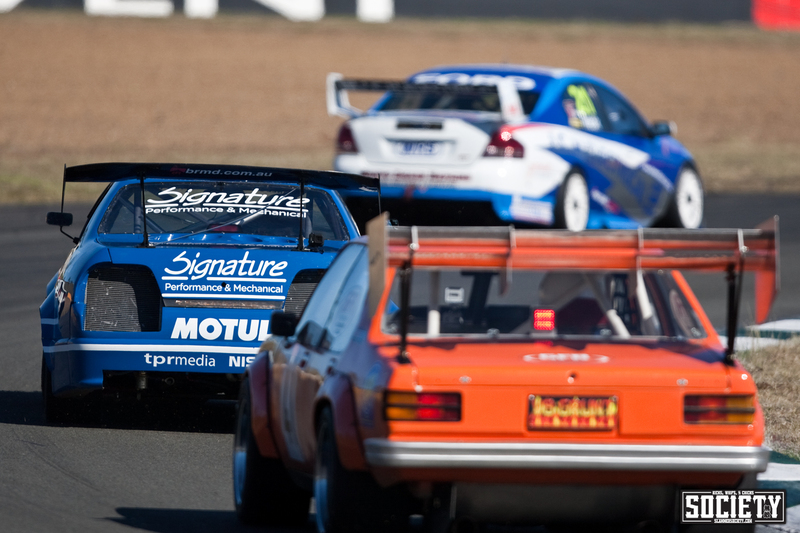 The World Time Attack Challenge has certainly cemented its place as a not to be missed event in the Australian motorsport calender. 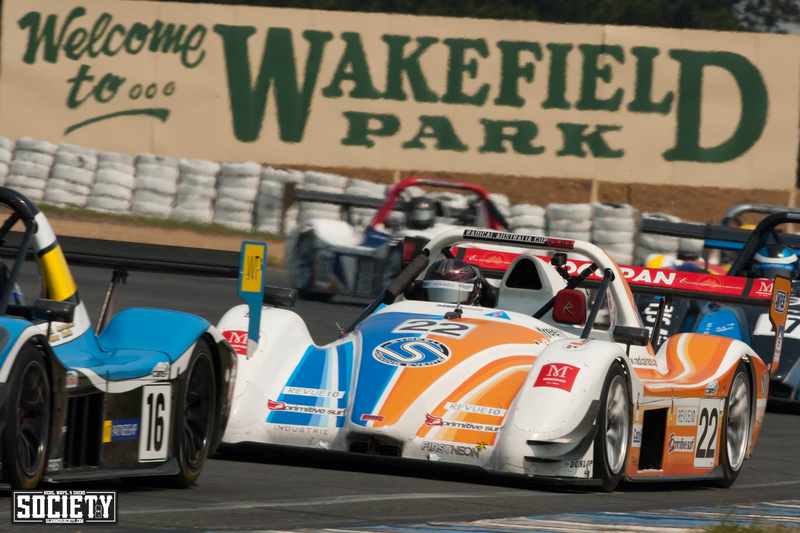 With two events to cover that weekend in New South Wales, it was back in the car on Saturday for what was a two hour drive to Wakefield Park for the final round of the Radical Australia Cup. With a championship at stake, the team took no chances with the preparation of the vehicle. Under the watchful eye of Paul Stokell, the car was prepared for the final assault. 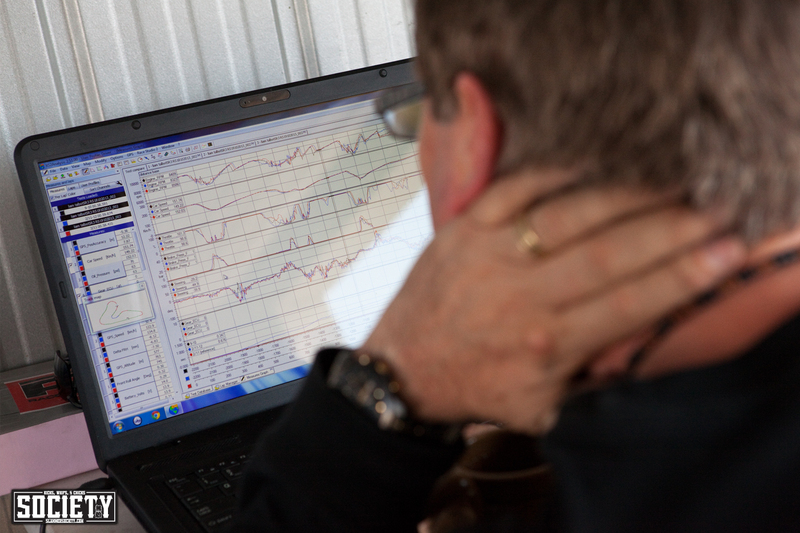 Engineer Ric Kemp studies the telemetry, looking for valuable tenths of a second. 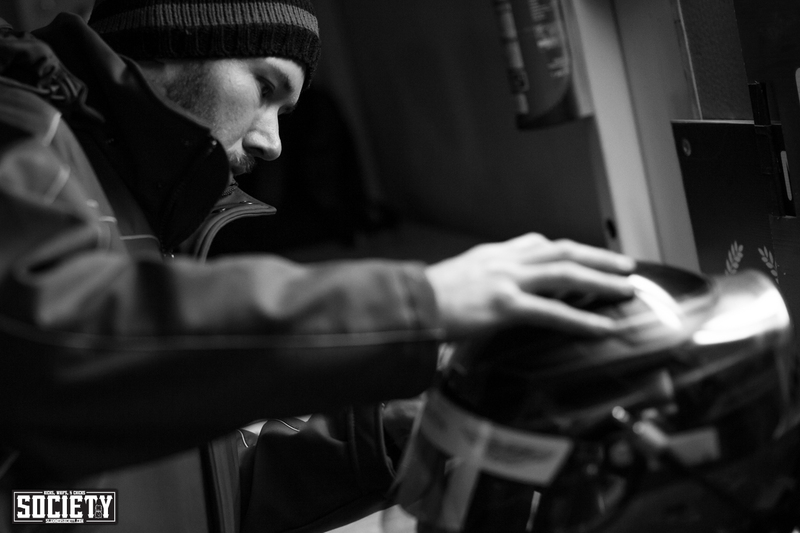 As we all know in motorsport, it all comes down to the day and five minutes into the 40 minute race, Liam’s water supply stopped, then during the race he was fighting a battle with the gearbox, with Ric in his ear telling him to just keep it going. 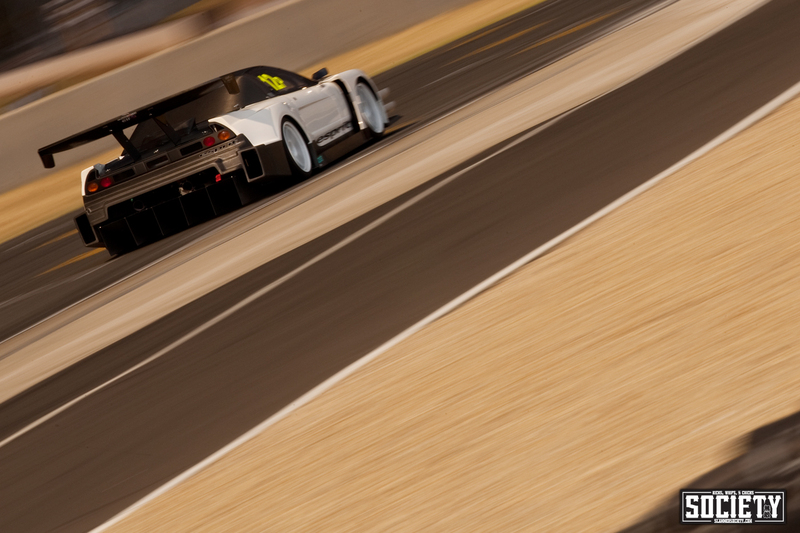 This was a very special moment to finish my year of motorsport, as Liam crossed the line for the final time and secured a championship in his rookie season. 2013 was honestly an absolutely exhilarating and exhausting year. I can’t believe what was packed in to those twelve months and what a privilege it has been to be a part of so many special moments. If you have made it this far, thank you for taking the time to share this journey. 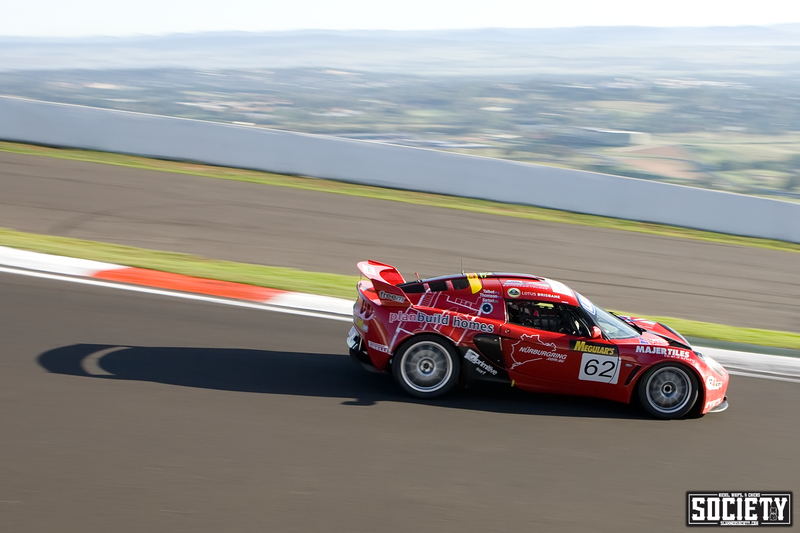 I never feel more alive than when I am out shooting motorsport and I am sincerely grateful for the opportunities. There are some big things happening as we head into 2014 and I can hardly wait for the year ahead. 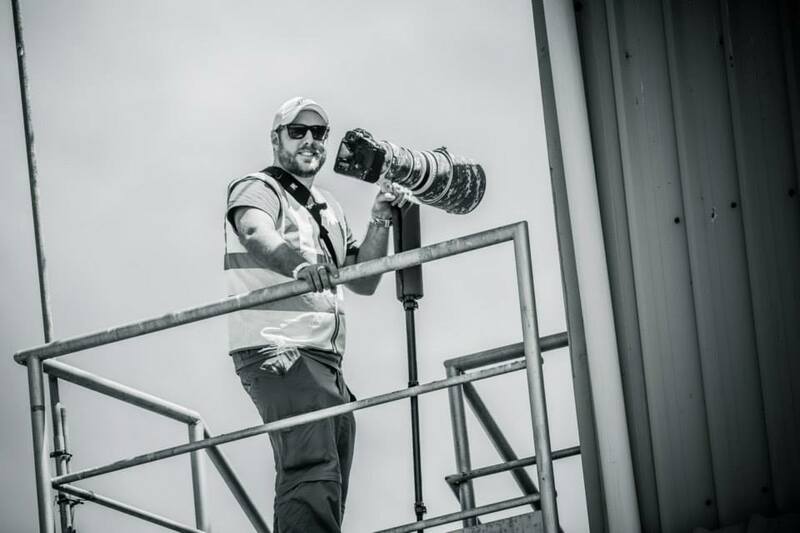 Thank you to my friend Luke Hobbs for the great pic on the job. Dope read! Really! The photographs are amazing too!